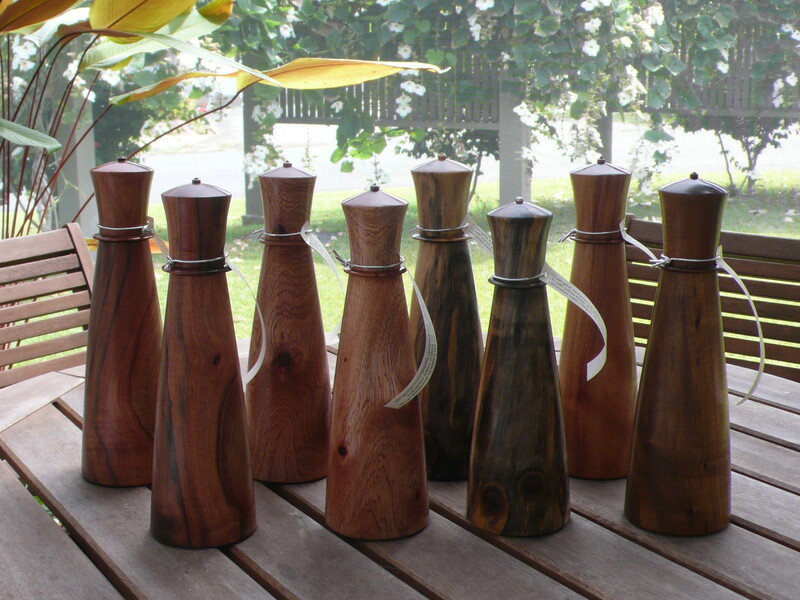 It started with a message broadcast to all Honolulu Woodturner members. A large Cook Island Pine had been cut down on a property being cleared for a new dwelling off Pali Hwy north of Honolulu. 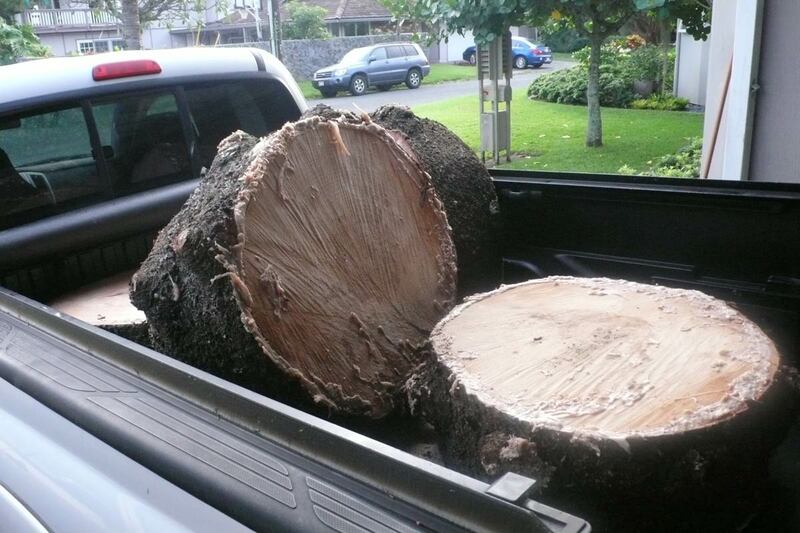 Two large pieces had been set aside and the owner wanted items turned from the salvaged log sections. 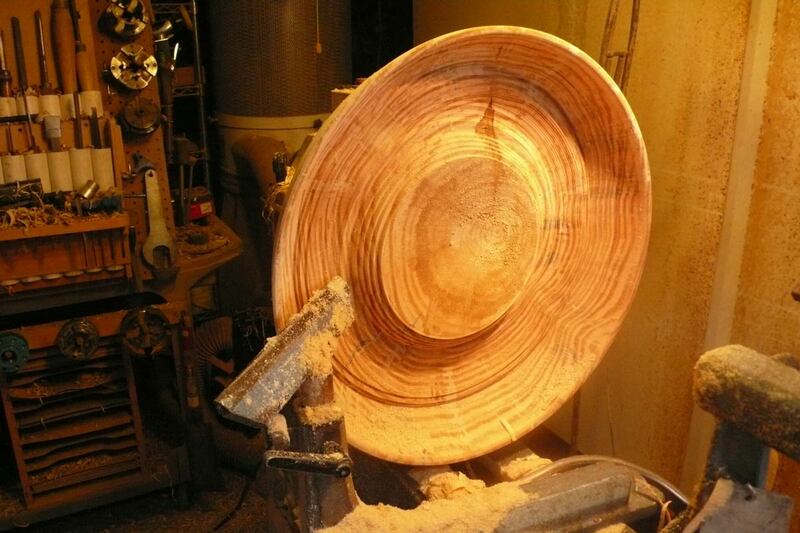 I met with the owner and saw two pieces that measured larger than the 24″ capacity of my lathe. My charge was to “make whatever I wanted” so she would have pieces from this tree. First I had to cut the two sections in half to have any chance at getting the wood to my shop. With my nephew’s help, we both barely managed to lift the four pieces on to my pickup. Once home and in my driveway, the pieces are literally dropped off the tailgate. It was about a month later that I was able to get to this project. The clock started ticking on the splalting process as soon as the tree was cut, because at least one “golden” piece was desired and evidence of splalting appears in about a week. First I scribed a circle after the bark was removed. A series of angled cuts with a chain saw got the piece under 24″ and I was able to fasten a faceplate to it and mount it on to the headstock. Turning begins. 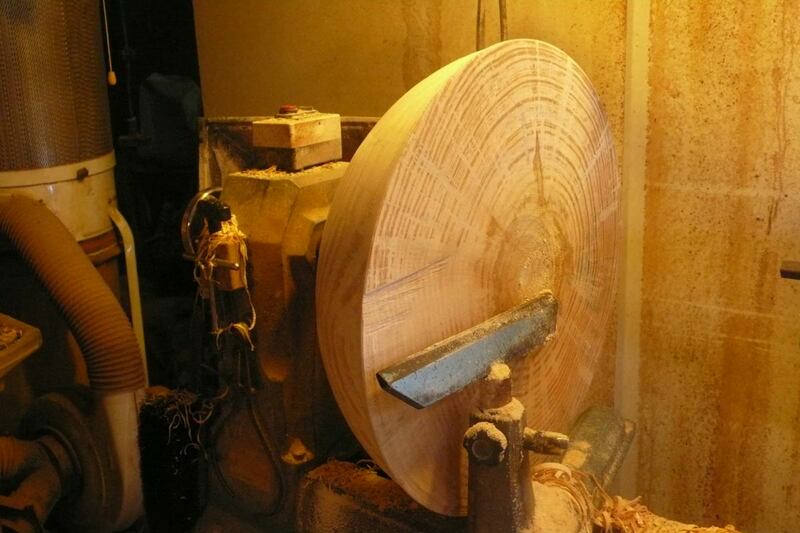 With this mass of wood spinning, you have to start out fairly slow. As the eccentricities are removed, the speed can be increased without vibration. 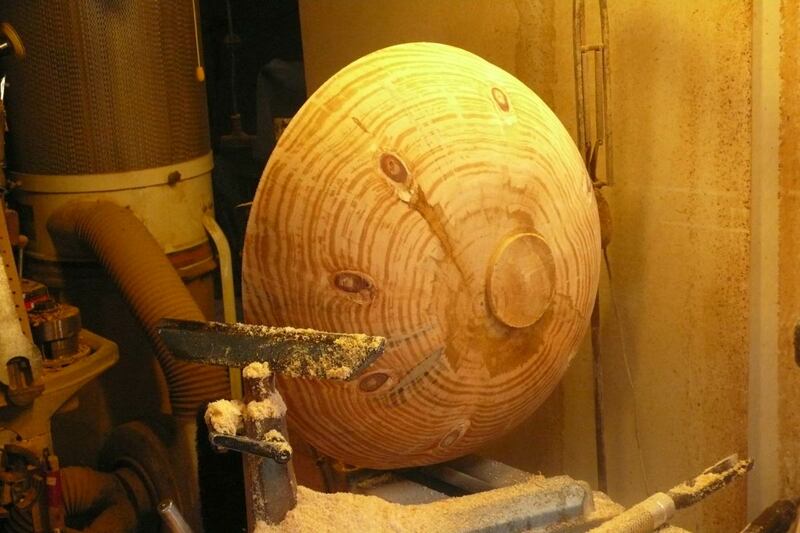 Getting to a round shape was actually relatively easy in this case, because common practice is to start roughing out with the bark still on and the log is often out-of round. The bark is about 5/8″ to 3/4″ in thickness. Here the piece has been turned round and the desired shape achieved. A tenon is left to reverse the piece on the headstock to begin the hollowing process. Here the piece is reversed and the tenon is held in a 4-jaw chuck. Notice there is a stain in the center of the log and some spalting has begun. Hollowing in progress. This is turning into the end grain of the wood. Whenever possible, I try to use the gouge in a downhill cutting mode rather than in an uphill mode against the grain of the wood. 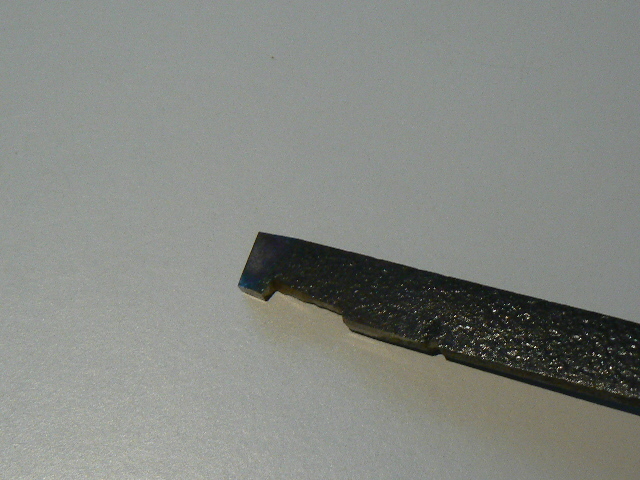 On the outside of the piece, this results in cutting from the rim towards the center of the piece. 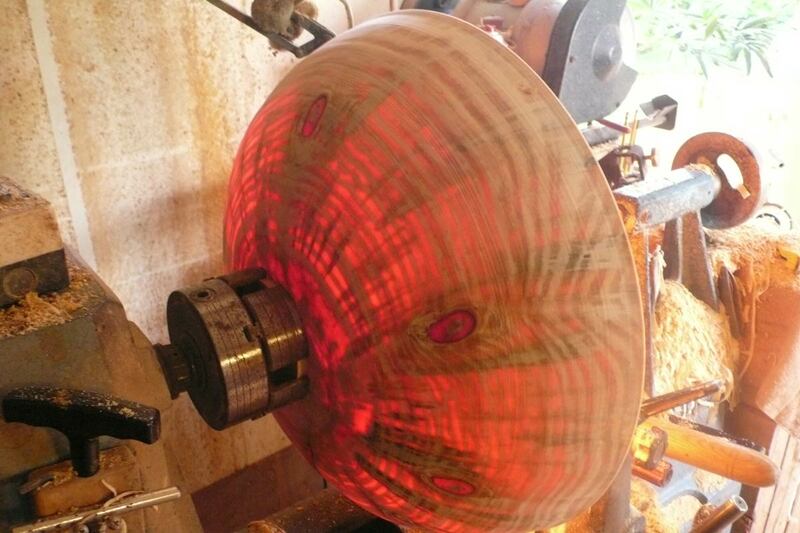 On the inside of the bowl, it is the opposite–cutting from the center of the piece towards the rim. For hollowing the inside, the strategy is to hollow a narrow shaft down the center of the piece so cutting can then proceed from the middle towards the outside. 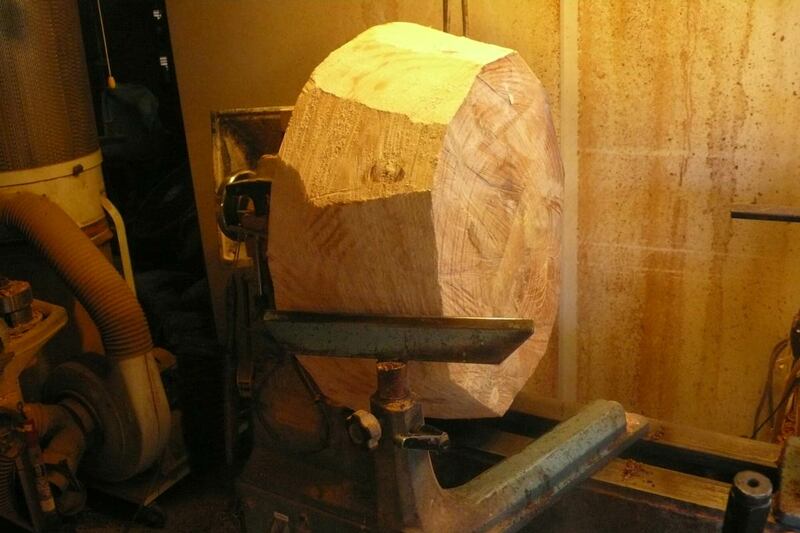 As the center hole is widened, the cuts are downhill and long continuous shavings can result, some over 6′ long. In this photo below, hollowing has progressed to where the rank of branches are encountered. Norfolk Island and Cook Pine is noted for its branches being on the same level rather than occurring haphazardly on the trunk. The branches go from the circumference to the middle of the log. 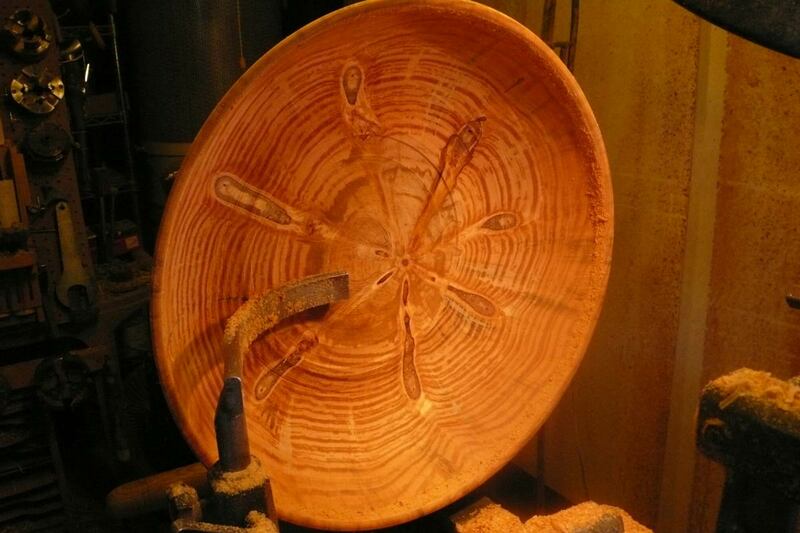 A pattern of knots can then be seen wherever the branches are being cut on the piece. 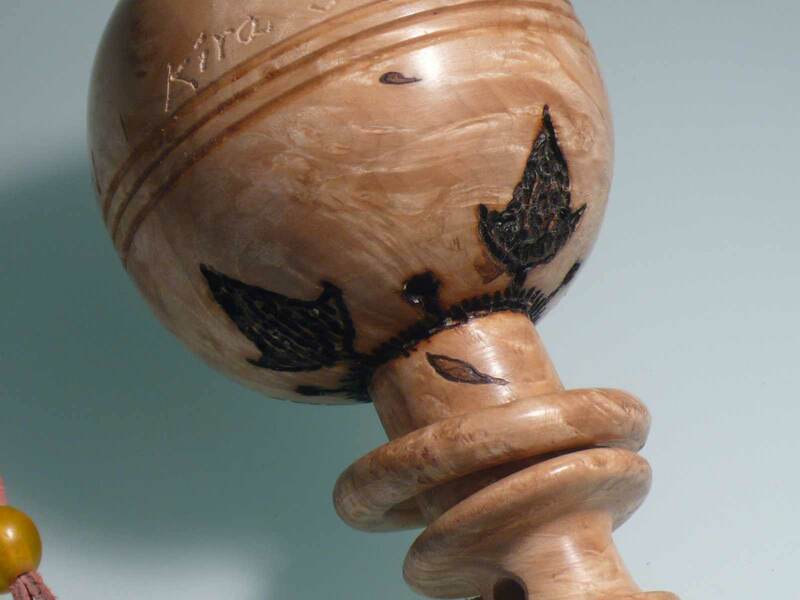 While the star pattern seen here is very attractive, the goal on this piece was the overall outside shape, and the inside shape should ideally follow the outside shape. To match the outside shape, the inside cutting has to proceed beyond this star pattern. 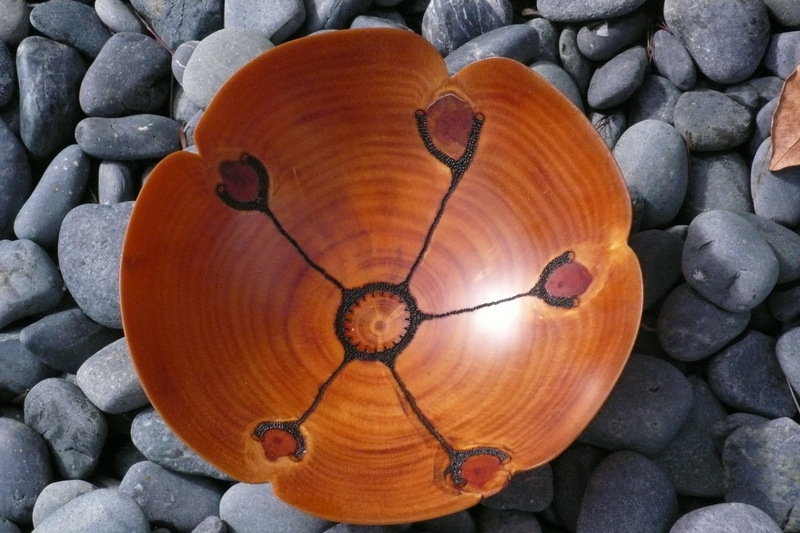 The branches will result in dark ovals on the side of the piece. 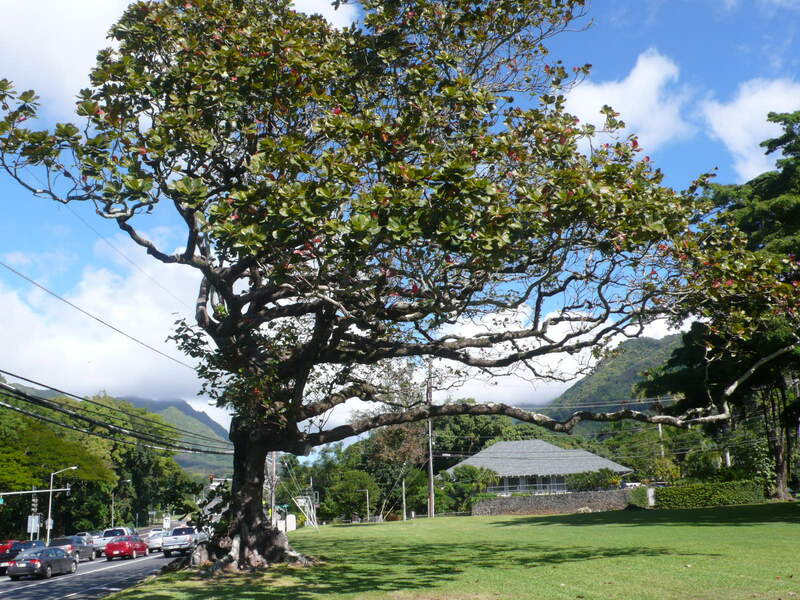 There can be as little as 4 or as many as 9 branches off the trunk at any position. If the goal on the piece was to achieve the star pattern, I would have to stop here and somehow make the outside shape match the inside shape. Another quarter-inch of cutting could affect the star patter drastically, so you need to know when to stop hollowing. This takes a little practice and trial and error. When the still-wet wood in thin enough, it will show translucence. A strong light from behind will help gauge the thickness as a thinner area will transmit more light. This translucence will be lost when the wood dries. 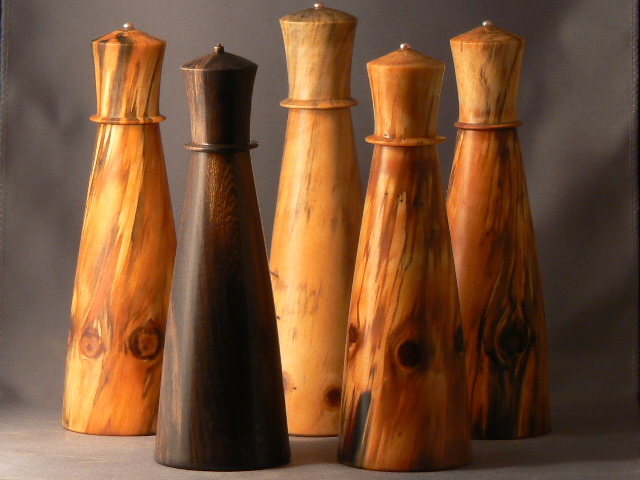 Ron Kent was one of the pioneers of soaking thin Norfolk and Cook Pine multiple times in an oil-based solution. After the wood dries, the piece is sanded smooth and immersed in a soaking solution. This solution can be right out of the can Watch Danish Oil Finish (natural), or a proprietary mix of your choosing. There are many recipes out there. My recipe is a slight modification of what late Russ Fairfield called his “Witches Brew”. 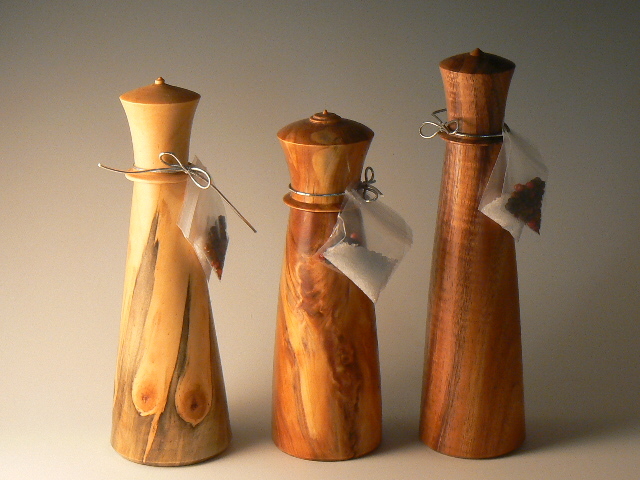 One gallon boiled linseed oil, two gallons paint thinner, and one quart spar varnish. Instead of varnish, I use one quart of oil-based polyurethane. The substitution is primarily because of the difficulty of finding an oil-based varnish as most products have become water-soluble. 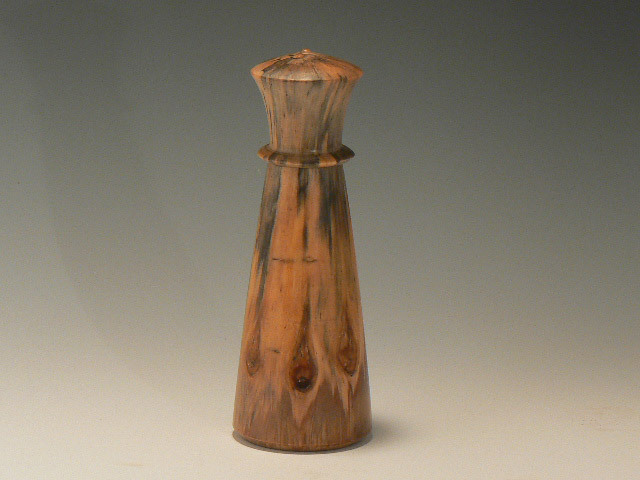 Ron Kent shared his belief that the translucence is achieved when the oil solution replaces the water in the cells of the wood; a polymerization occurs and is not evaporated from the wood as when the piece is first turned and dries. He also believes that there has to be a repeated wet and drying process to occur to get the polymerization complete. Wet-sanding after the soak also helps the liquid penetrate the wood. The soaking and drying process is repeated until translucence reaches a point of diminishing return. One cycle is soaking overnight and drying the next day. On this piece, the wall thickness is 1/8″ to 3/16″. Soaking of the piece was discontinued after 9 cycles. Wet sanding was done by hand after each soak, starting at 220 grit and increasing in smoothness until 1200 grit. After the Beall 3-buff system, this is the result. This shot was taken outdoors in partial sunlight. This shot taken in the same location; at dusk with a floodlight from above. Final diameter of this piece is 21-1/4″. Height is 6-3/4″. To go from start to finish on a piece this size without any glitches is quite an accomplishment for me. 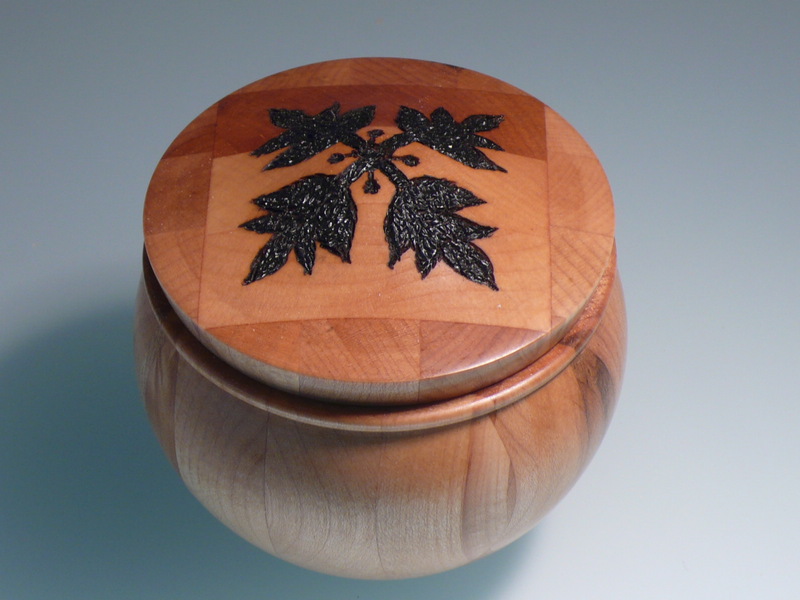 Pyrography on woodturnings, in its simplest terms, is like branding wood with a hot iron, but under more precise and controlled conditions. I got introduced to pyrography through Graeme Priddle from New Zealand, who showed our woodturning club, Honolulu Woodturners, how to make an inexpensive burning system with a modified car battery charger using an ordinary light dimmer for heat control. The heating elements were bended nichrome wire. This system really puts out a lot of power, and in my novice attempts at its use, I basically fried the internals from excessive heat. With my home-made burner out of commission, I went looking for another unit. There are a handful of manufacturers out there. Molly Winton, whom I met at the Portland Symposium in 2007, endorsed the unit made from Burnmaster. The main factor in choosing this unit was the more robust connectors (RCA plugs versus pin connectors). I got the model with two ports versus the one with the single port, which turned out to be a good idea. Like all new techniques, there is a bit of a learning curve. There are pens with fixed tips and units with terminals (tips) were you can bend and connect your own nichrome wire, the heating element. Which tips you choose depends on how you intend to use it. I was attracted to the basketweave pattern that Molly is known for, because it replicates the pattern we used to render the ground in our presentation drawings. In practice, I found it better for me if I used the single point method because I could achieve better detail. This is because I basically just follow the lines in my burning. I learned from artist and woodturner John Mydock (exceptional detailed burning) that it just takes a lot of time to do this work and he does it at a leisurely pace. When asked for a recommendation, John liked the Detail Master fixed tip pens. All pens and points, interchangeable or not, cost in the range of $20 go $30 each. My experience starting out was the pens would get too hot to hold, no matter what pen or point I used. I could perhaps work for 5 minutes and cover maybe one square inch, and would have to stop and allow the pen to cool down. This is where the 2-port unit was a good choice. I got two Detail Master pens with the same point. When one got too hot, I would switch over to the other pen on the second port, and continue working while the first pen cooled off. This cut the working time to a great extent and the burn pattern I achieved was more consistent because the work flow was not interrupted significantly. I believe you can see the difference from the early photos to the latest. In my first big burn project I got a quilt pattern designed by family friend Bud Henry. I taped a photocopy to the bottom of a salad bowl shape and stated burning with disastrous results. The paper started smoldering and the embers traveled, and I no longer had a pattern to follow. I ended up having to trace the rest of the pattern with an Xacto knife, and filled in the cut lines after that. Fortunately, getting “off he tracks” for not having a pattern to follow was not very noticeable in the final result. Soon after this experience, I learned about a sticky-back film that did not support combustion. This film, called “Stick and Burn” is available from Welburn Gourd Farms. There is a film type for laser printers, and one for ink-jet printers, which cost more per sheet. I started with the ink-jet film run through a laser printer at Kinko FEDEX. This method works, but the image is susceptible to flaking off if the film is bent severely. I now have a laser printer and while the film curls into a cylinder as it comes out of the printer, when unfurled it seems to work well. Fist attempt a pyrography was filling in a random pattern of a wood stain that sometimes occurs in in the trunk area of Norfolk or Cook Island Pine. The stain was darker than the surrounding wood, but making the stain black resulted in greater contrast and visual impact. This branding took a long time because you had to wait until the heated pen cooled sufficiently to resume working. This particular task was done over several days. Bud Henry’s breadfruit quilt pattern. Progress shot with burned paper removed after tracing pattern through the paper with and Xacto knife. If you look carefully, the leaf burned pattern at the lower left is different from the other three with similar design when the paper burned away and the pattern was lost. Quilt patterns are often done in a quadrant that is repeated on two axes. Finished pattern. Can you find the one that doesn’t match its mirror image? Answer: The one at the 12 o’clock position. 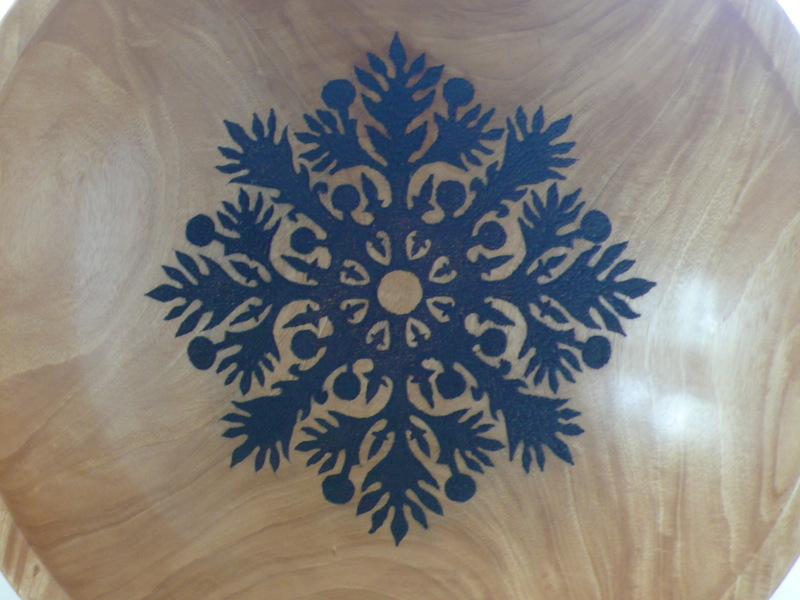 This pattern is on a Primavera (Gold Tree) bowl about 16″ across. This is a logo from a local bank. 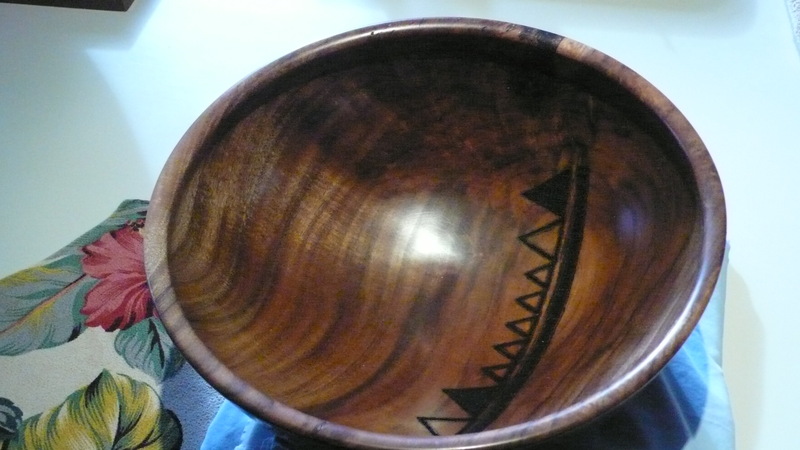 The wood is from a False Kamani tree root that was above ground. This piece was sold at the Puhahou Carnival Art Sale in 2012. The piece was titled “That’s my bank” after a slogan from an advertising campaign. 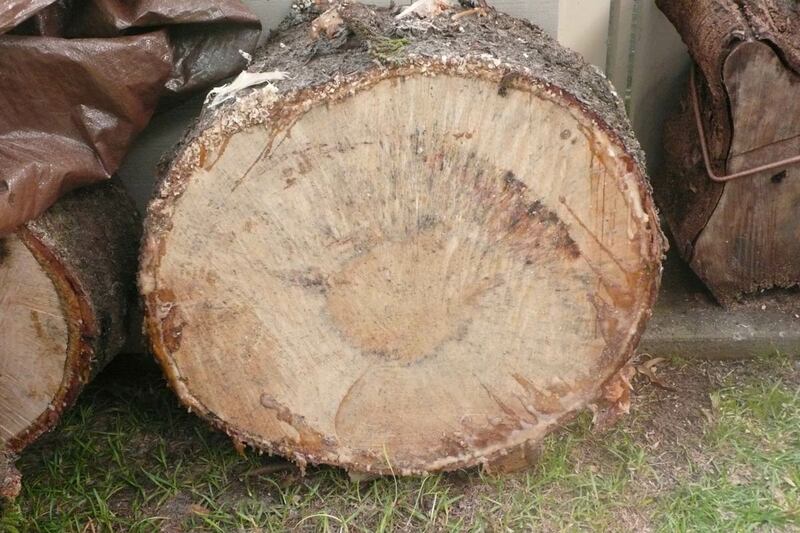 This is a piece of Formosan Koa from a tree taken down at the Punahou Regency condo on Beretania and Punahou Streets. The thick underline was to disguise a large check (crack) in the wood. The outside surface has several butterfly patches (pewas) on the check but the patches do no show on the interior. A visible crack on a piece with a butterfly patch is commercially acceptable and often a desirable feature. 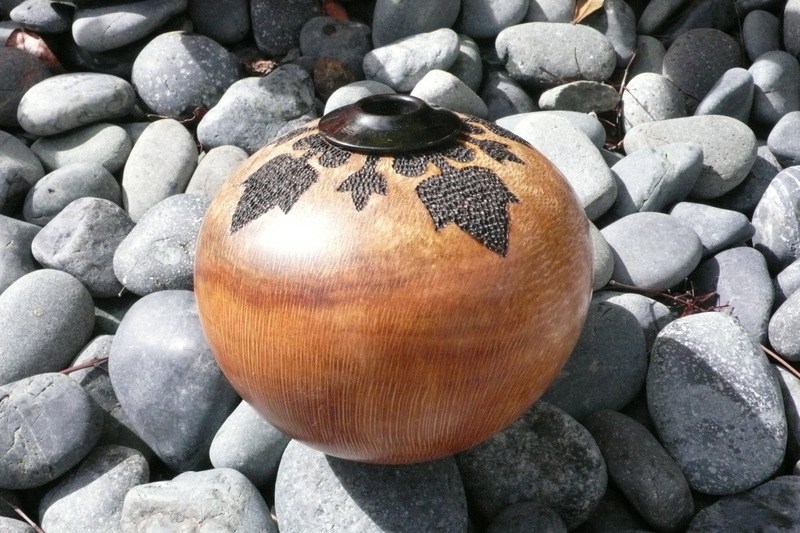 This is a box made from a hardwood bowling pin (maple) with a made-up graphic using a Kukui Nut leaf as an inspiration. The box is about 3″ x 3″. My first attempt at burning typography. By this time, the stick-n-burn paper was available and the font was created on the computer and printed on the film. 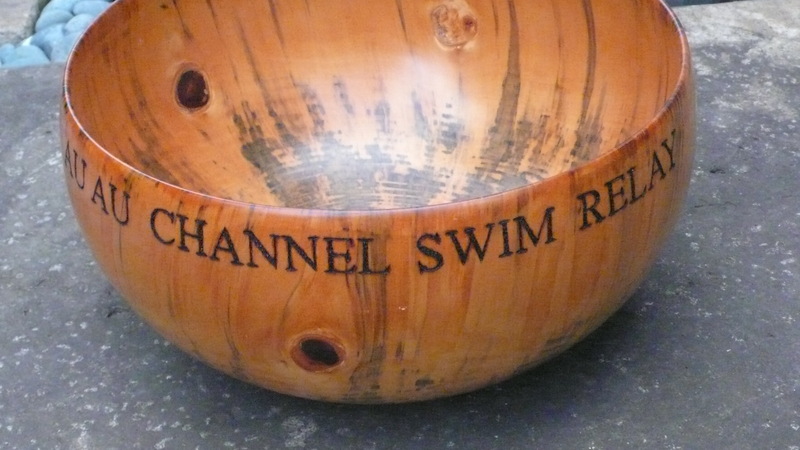 This is for a perpetual trophy commissioned for the open water swim relay between Maui and Lanai islands. This trophy was for a newly created category for the 6-member relay: Extreme Makule (older person in Hawaiian) Division. The qualification for this division is a total age of 420+ for the team members. The organizer first wanted the trophy to have the name on an engraved plaque. I offered to burn in the name because time was not available for engraving. 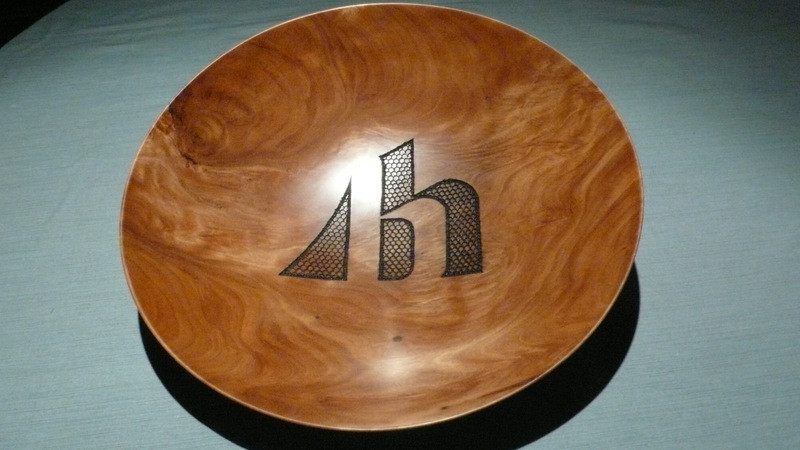 As it turns out, as I learned in the perpetual award for Hanahauoli School, engraving is not possible on a plaque greater than about 4″ if placed on a compound curve surface. 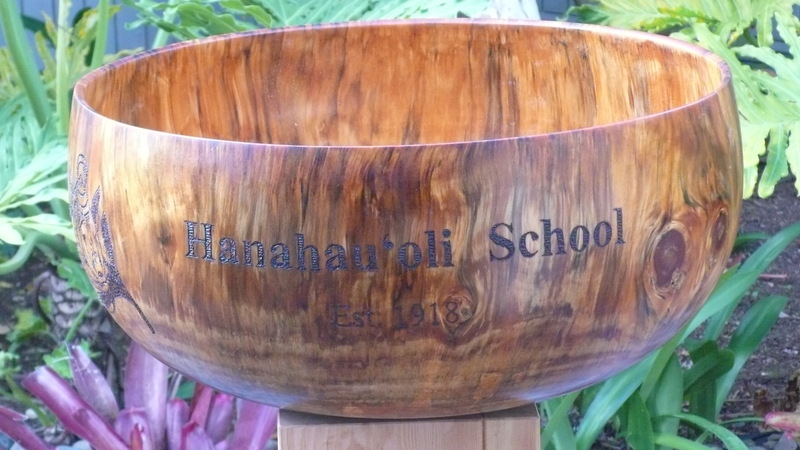 This is a 19″ calabash donated to Hanahouoli School (where son Ryan attended) at the retirement of Dr. Henry Peters, principal for over 30 yrs. Pyrography was to be limited to burning the school logo on opposing sides. When engraving of the school name on a plaque was limited in size, I then burned the school name and date of establishment. The engraving house furnished the names of the nine previous school principals and I was tasked to position and mount the small rectangular plaques on the opposite side. Along with double-stick tape, the brass plaques have two 1/4″l brass screws for each principal’s name. 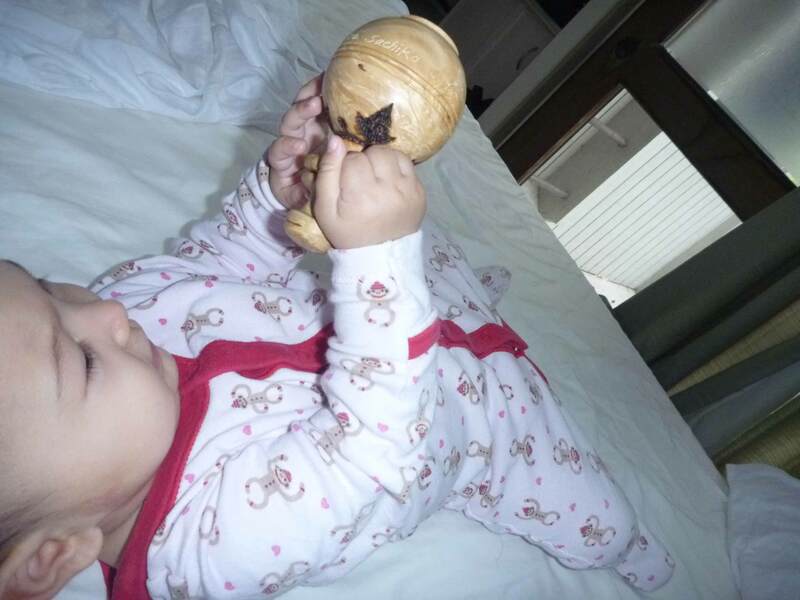 There was a concern that the screws when fastened would penetrate the walls of the calabash. This perpetual recognition piece is slated for permanent display in the school gallery adjacent and below the school office. This is a detail shot showing the stick-n-burn film on part of the school name. The film has been removed from the first two letters “Ha”. 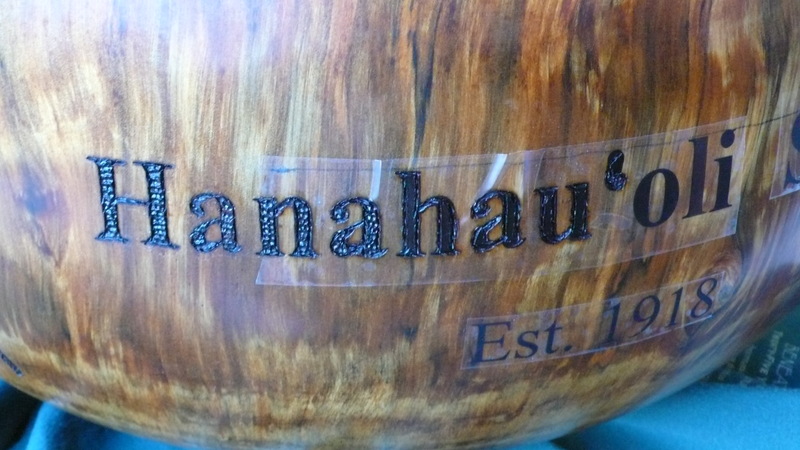 The burning has been completed on the letters “nahau”, with the film still in place. The other letters and the establish date are yet to be burned. Guide lines with a grease pencil are easily removed. 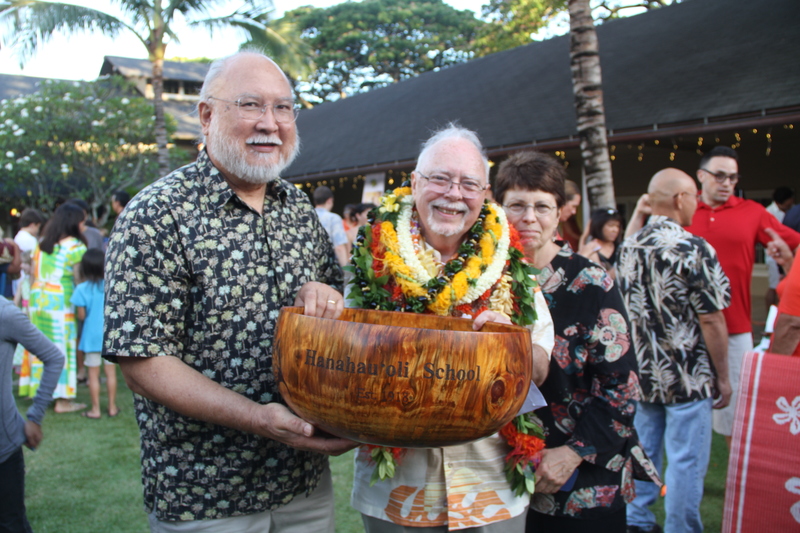 Artist and wife with Dr. Peters after his recognition ceremony at Hanahauoli School courtyard. Milo crotch platter with undercut rim. Argentium silver inlay at 1/8 points with burned pattern around the rim. Platter width is 13″. 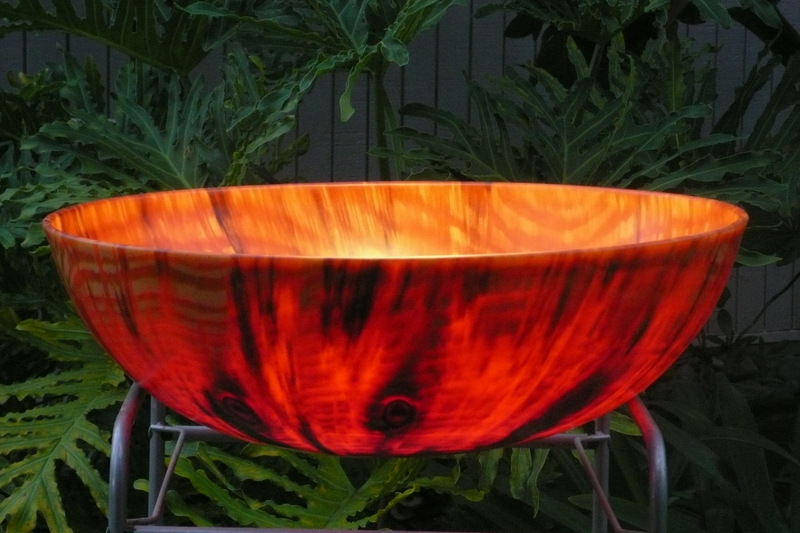 Will be entered in the 2013 Hawaii Forest Industry Assn. (HFIA) Wood Show. 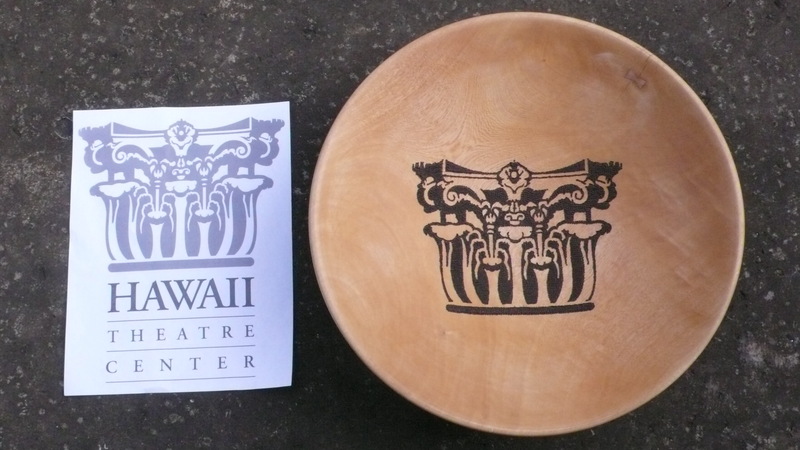 Jacaranda wood bowl donated to the Gala Fundraiser for the Hawaii Theater Center annual event. This column capital logo was difficult for the many small details involved. If any person knows who purchased this piece a couple of months ago, please let me know. 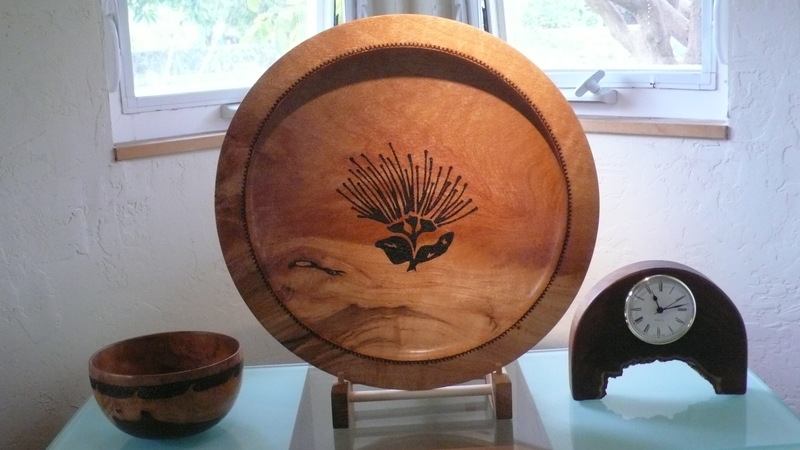 Silky Oak platter with undercut rim and carved feet, 18″ in diameter. Burned scalloped pattern at the inside of the rim. Lehua flower pattern in center, with a nod to the Lehua Jaycees for copying the graphic from their logo. 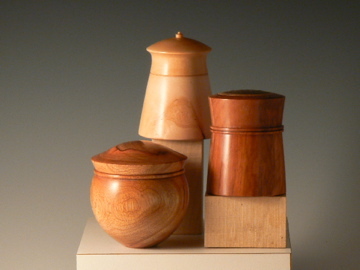 This piece will be also be entered in the 2013 HFIA Wood Show. 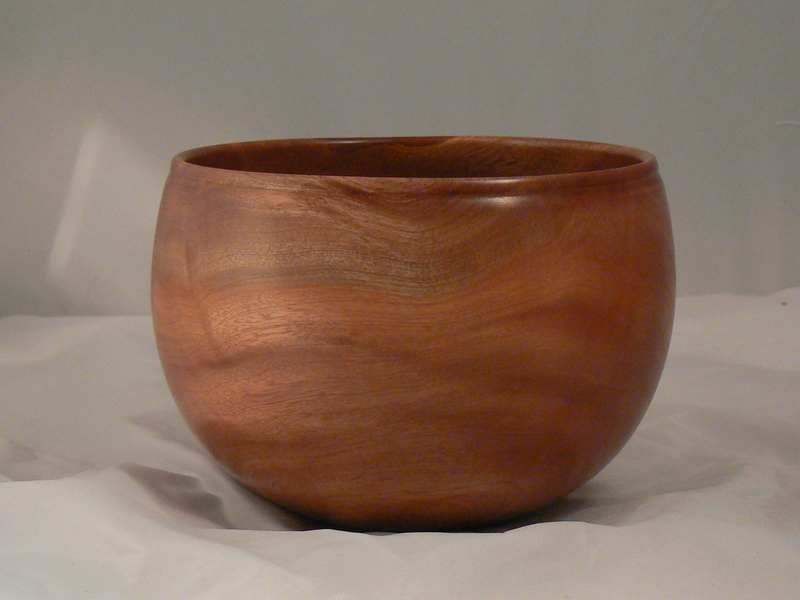 This is a Milo bowl, again with an undercut rim. Argentium Silver inlay at quarter points. A lot going on in this piece, with the figure and sapwood/heartwood elements. About 16″ across and about 5-1/2″ deep. Rather than focus on the rim, decided to add a dragon graphic in the center because the burning gives a snakeskin-like feel to the piece. Wood courtesy of clubmember Craig Mason; from the Kaneohe Marine Base golf course. 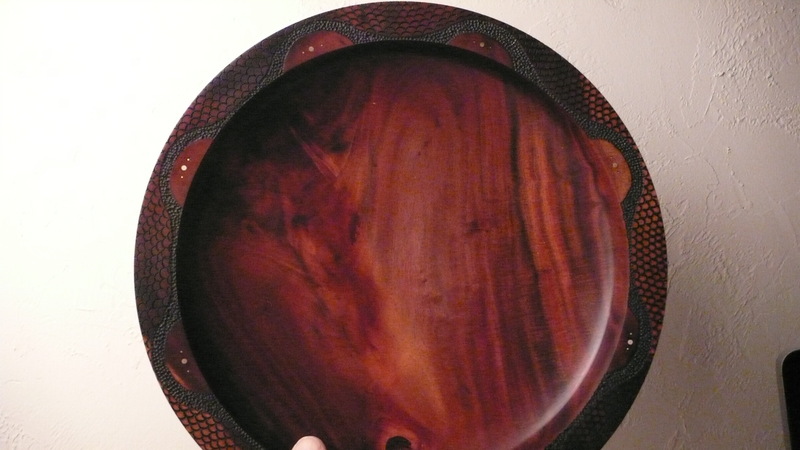 Considering entering this piece in the 2013 Hawaii Craftsmen juried exhibit. This is my first hollow form, using a hollowing rig from Don Derry. About 8″ tall and 7″ wide. 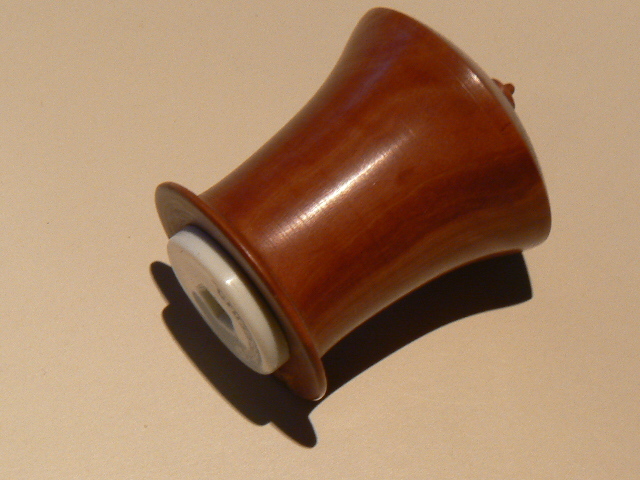 Hollowed through a 7/8″ hole with an ebony collar added to keep those prying fingers out;-). Walls abut 1/8″ thick. This is one of the first pieces where I used the same pen in the twin ports of the Burnmaster Eagle burning unit. The consistency of the burn pattern is evident in this piece. 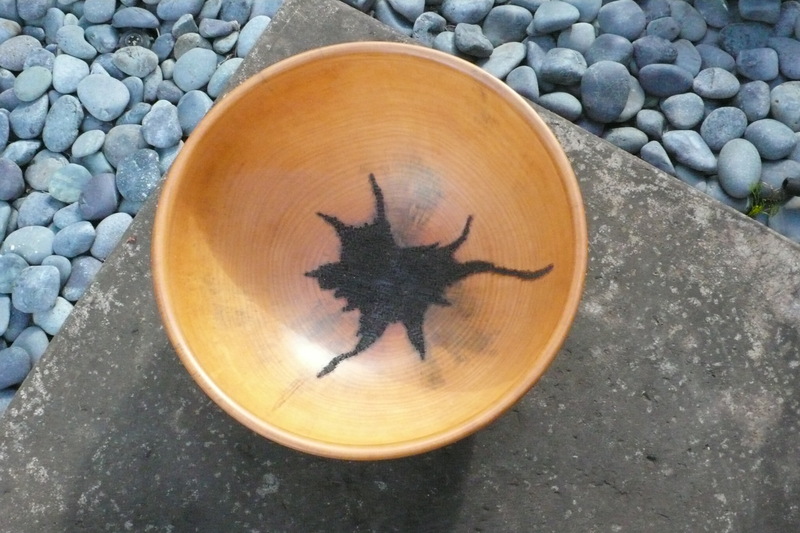 Some woodturners paint the burned field black for a darker, more consistent color. In this case, Workable Fixatif spray was used, which gives a clear, matte finish. Wood is Sliky Oak. Burn Detail. The quilt pattern is a Kukui Nut pattern found on the internet. 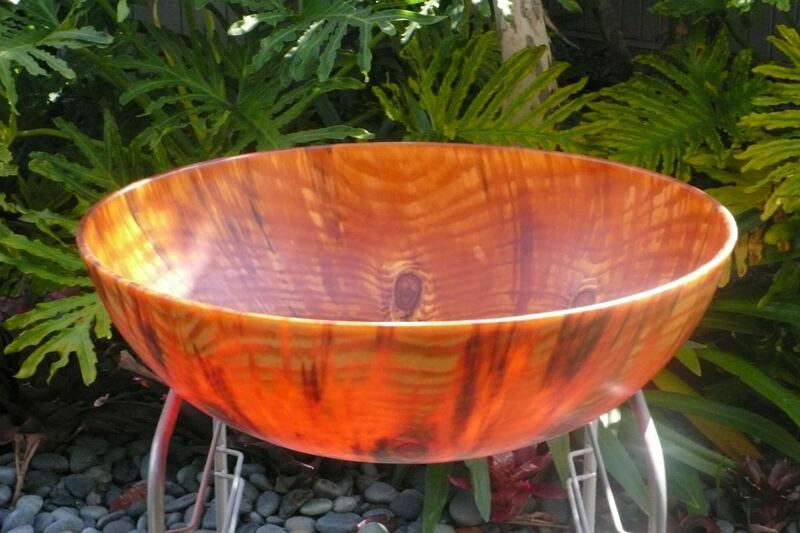 Natural edge Norfolk Pine, translucent, with a decorative pattern that is a takeoff from the naturally occurring stain from the knot towards the center that can se seen in the 5 o’clock position. About 8″ across and 4″ high. Another translucent natural edge Norfolk Pine, this time with pyrography around the knots and around the scalloped edge. 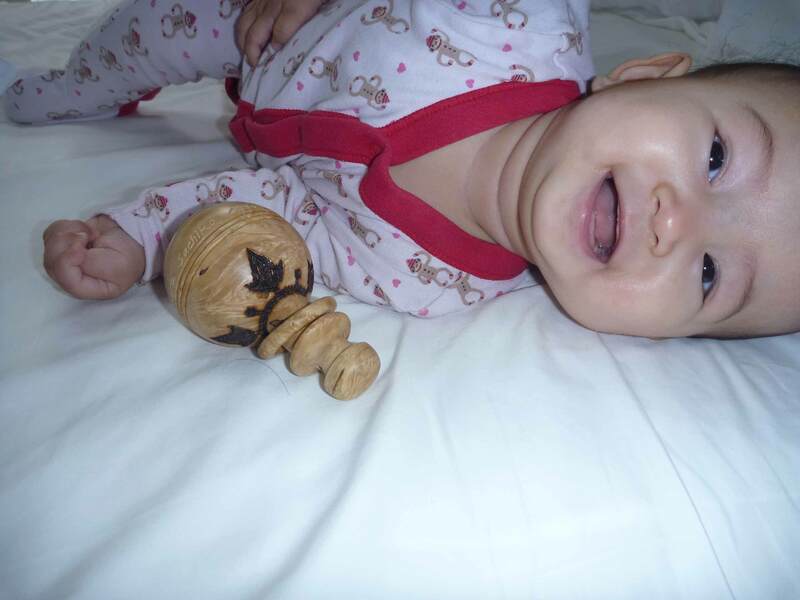 My first attempt at a baby rattle was nine months ago–the first week-end after my granddaughter was born on March 2. I used a piece of boxelder burl that was sent to me in a wood exchange. 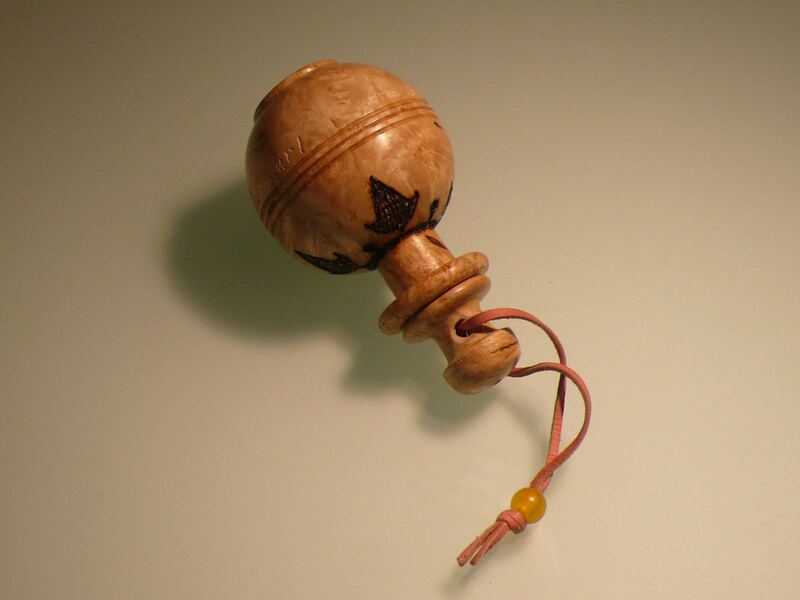 This is basically a hollow sphere with a spindle shaft attached. The sphere was split with a parting tool and the hemispheres hollowed and filled with plastic beads approximately 1/4″ in size. Allowances should be made for the loss in the middle when the rabet is created on one of the hemispheres. The join is disguised in the three center grooves. From earlier efforts at resealed hollow forms, I knew that filling the interior volume was not productive, as the sound is lessened when the void is nearly full. There are no strict guidelines for quantity, but filling the void to about 30-40% seems to work well. Titebond II glue was used at the join. After applying pressure for about 30 minutes work on the piece can be continued, but allow for drying overnight. I started with a tenon on both ends of a cylinder, but eventually these will have to be removed during final shaping, and it helps to have some cushioning on the jaws of a chuck to minimize clamping marks. I fashioned a captive ring (my first) using a spare screwdriver ground to undercut what started as a tall bead. Finish was with the Beal buff system after some wipe-on Watco Danish (clear). 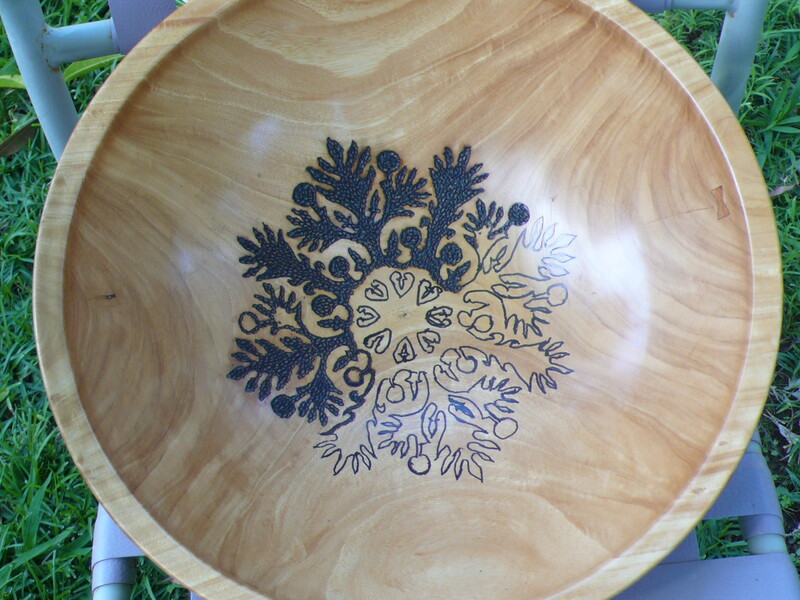 The burning was patterned after a Kukui Nut Tree leaf. 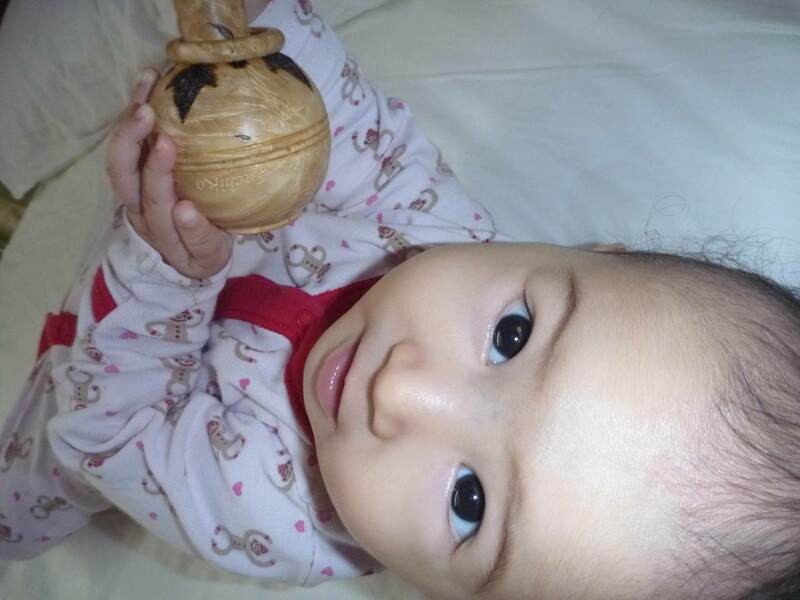 Granddaughter Kira saw the rattle for the first time when she was 7 months old. 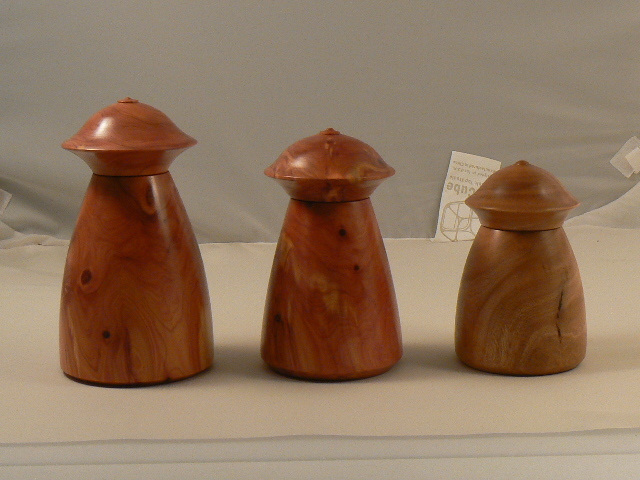 Woods are, l. to r.: Maple, Longan, & Olive. 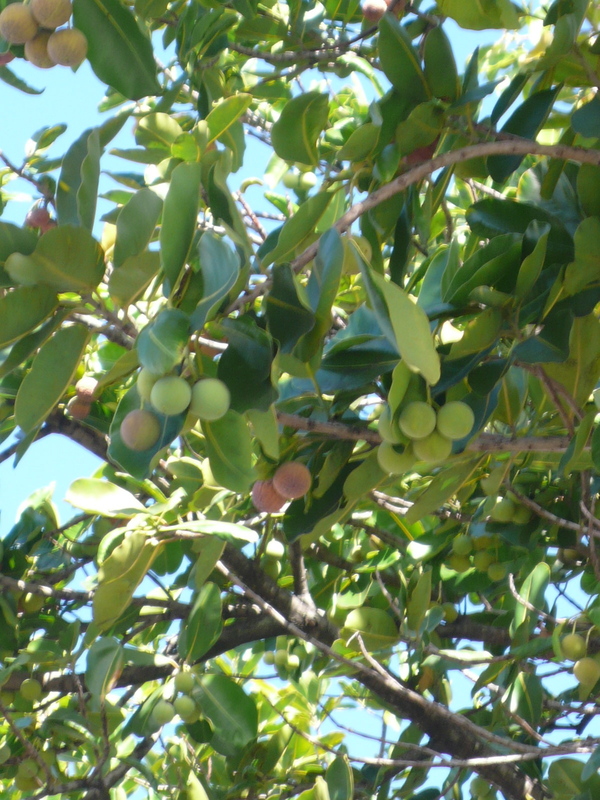 Kamani, or True Kamani, Calophyllum inophyllum, is a Non-native tree from Polynesia. 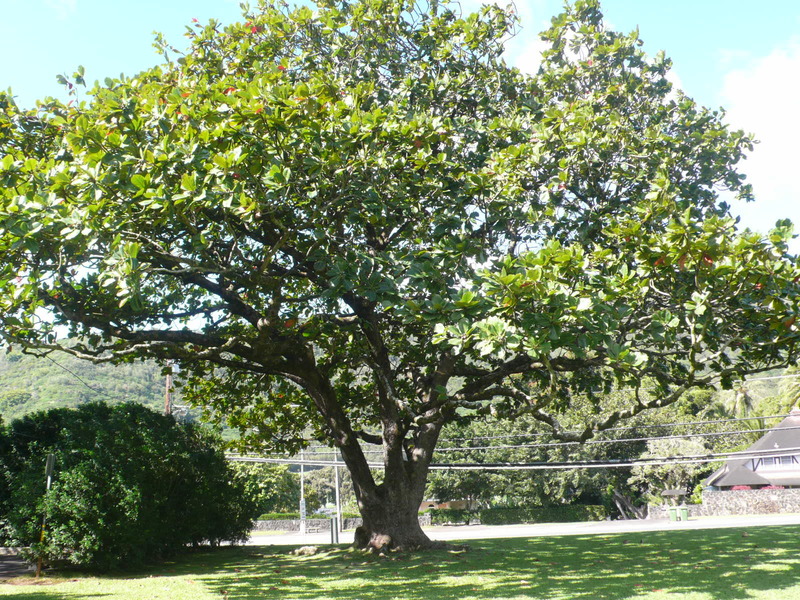 False Kamani, Terminalia Catappa, is a naturalized non-native tree, both found throughout the islands. Perhaps because the seed floats when dry, it is easily spread in diverse areas around the islands. Once you know what to look for, it is easy to tell the difference between these two species. The cut wood, however, is difficult to differentiate, at least for me. The grain and figure in Kamani, as well as the color, is very distinctive. It turns well but the center area of a branch or trunk is prone to being soft and punky. 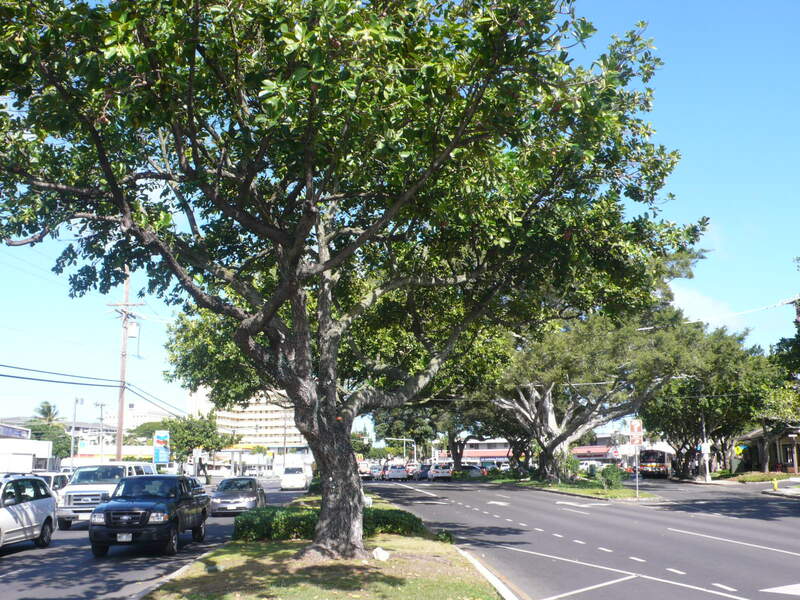 True Kamani is often used as a street tree in Honolulu and can be found along Dillingham Boulevard and at the main intersection in Kailua town. True Kamani: Kailua Road near Oneawa Street. 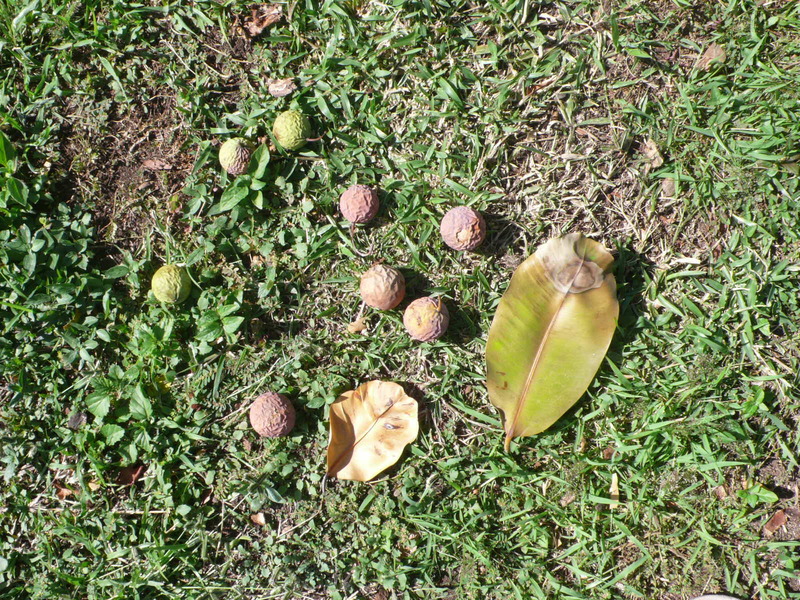 Detail view of tree with green and brown seeds before they drop. True Kamani: Leaf and seed pods. The seeds are about the size of golf balls, perhaps a bit smaller. False Kamani tree roots. 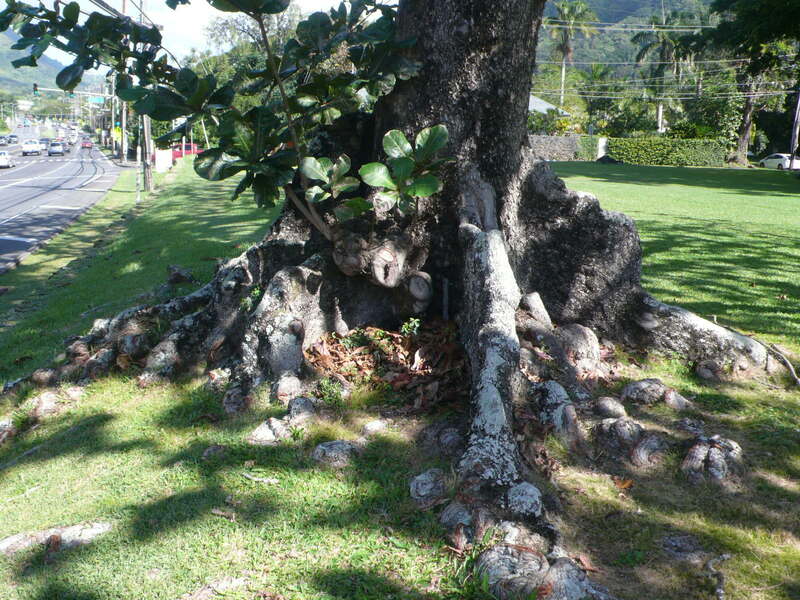 Roots are common with a habit of wall structures up to two feet above ground spreading around the trunk. Adjacent False Kamani but with a different root structure. 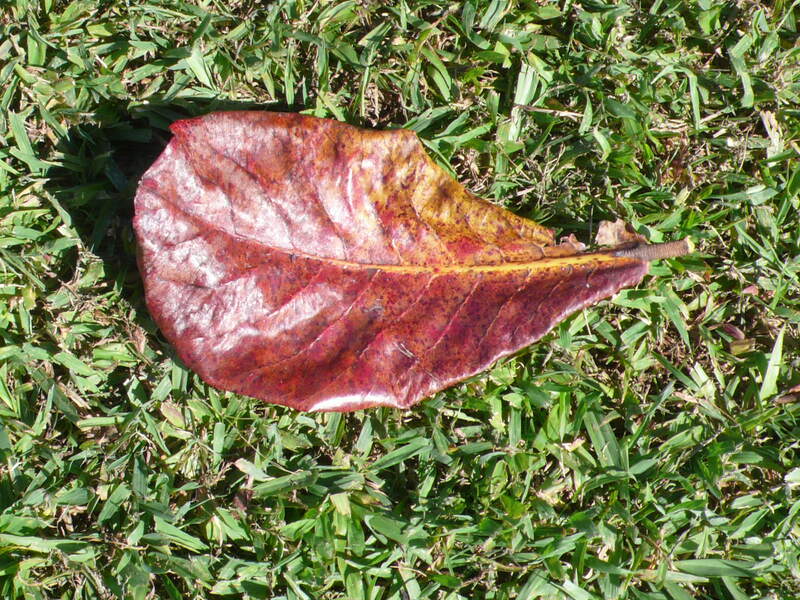 False Kamani leaf. Can be the predominant color on the tree. False Kamani pods. 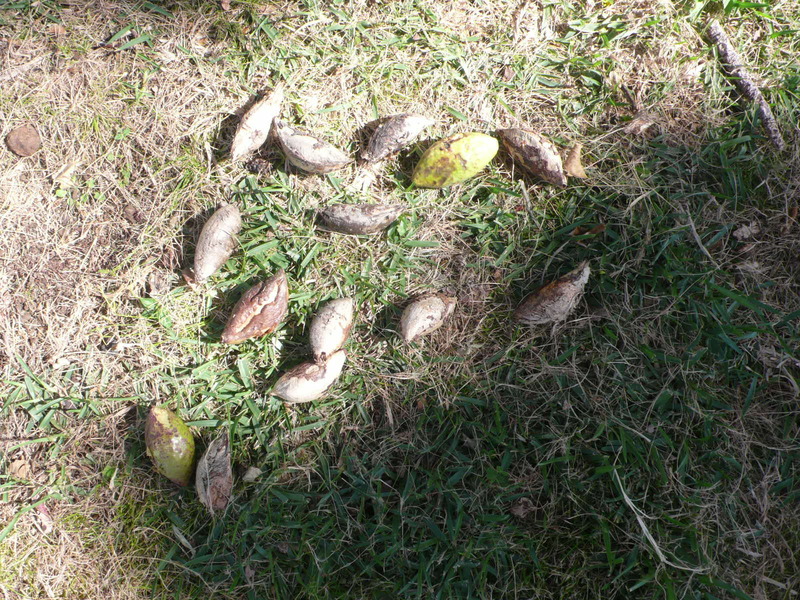 Because seed pods are often present around the tree, looking for the seed shape is the easiest way to identify the tree. 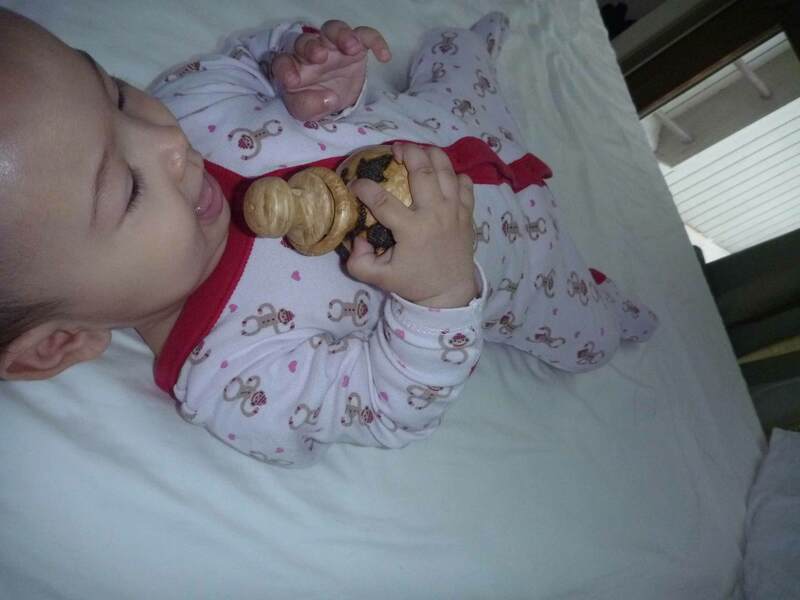 Kamani Wood pieces: As mentioned, I cannot tell whether the wood is from False or True Kamani without seeing the tree first. 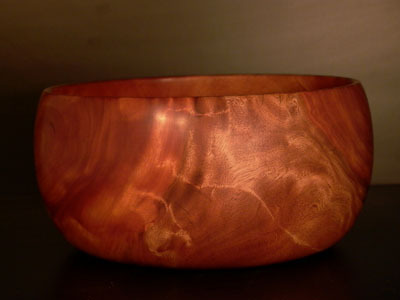 Calabash shape. This piece has a lot of figure and chatoyance. Small bowl approximately 8″ in diameter. Kamani Box is on the lower left. 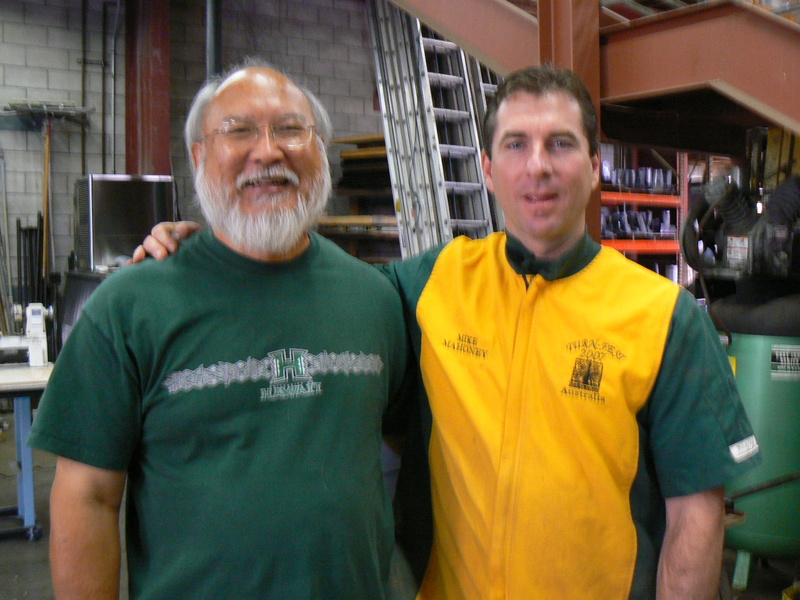 I took over as our club’s coordinator for visiting demonstrators in 2008. How do we determine who the demonstrators will be? Most often, it is by networking and word-of-mouth. Often a demonstrator will send out a feeler saying he/she would like to be considered. Some will contact us because we are approximately midpoint to another gig in the Orient or Australia/New Zealand. Each of our clubs are independent, and whenever a demonstrator is put up as a prospect, the coordinators from each club will poll either the membership or executive committee of their respective clubs to decide if the club is willing to sponsor the demonstrator. Realistically speaking, we are talking about two successive week-ends. Multiple venues help to amortize the cost of getting to the middle of the ocean and the demonstrator (and companion, if not traveling solo), has a week of ‘play’ in between. On the Big Island, if both clubs choose to co-sponsor, a venue between the clubs is chosen to cut down on the commute time. ( They don’t call it the “big island” for nothing). 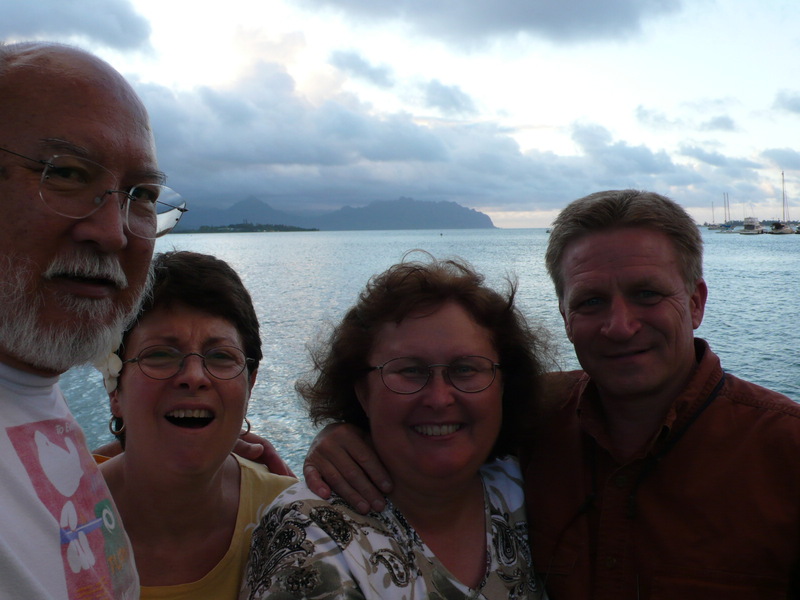 A new club recently got organized on Kauai island, which presents an added wrinkle to the scheduling effort. Fees for attending the demonstrations and hands-on sessions varies from club to club. The clubs have formalized a policy of not paying for the cost of a demonstrator to get to Hawaii. We feel that demonstrating in Hawaii should be considered a working or subsidized vacation, and he/she should want to visit Hawaii enough to consider absorbing the cost of travel to get here. What follows are more or less candid shots of demonstrators who have been our guests. 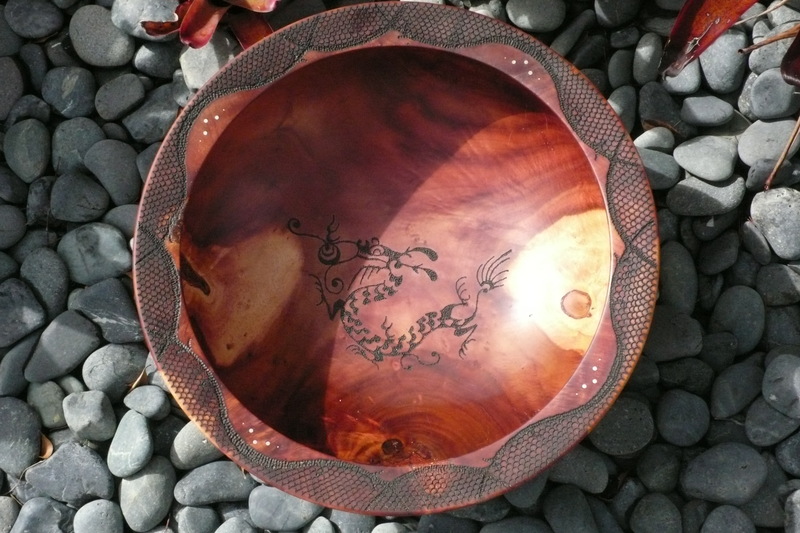 For a more comprehensive view of demonstrators since 2006, please refer to our club website: honoluluwoodturners.org, under the Events listing. 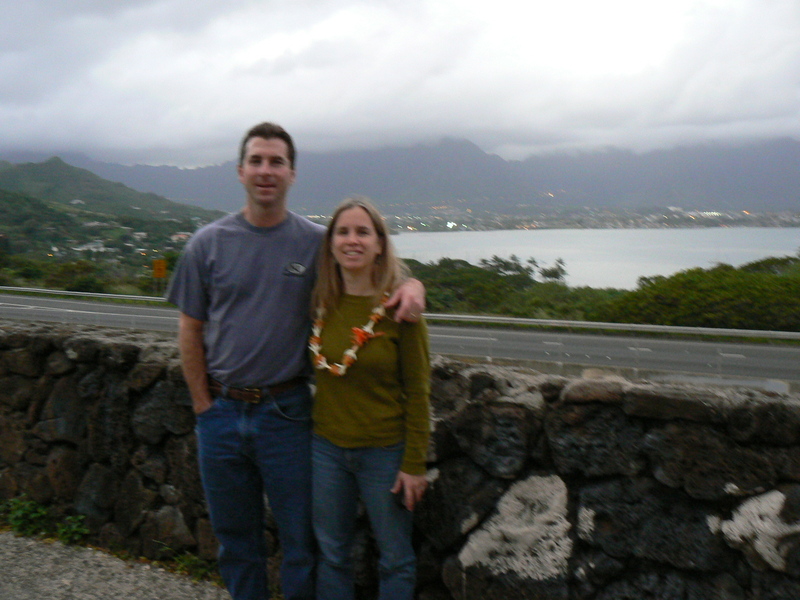 Mike and Jenni were married in Hawaii, so their return in January of 2008 was like a second honeymoon. I asked Jeni if she went with Mike to many of his demo gigs, as she has her own career. She said: “Only the good places”. They like the outdoors and did active things during the week days. Mike said what he enjoys is listening in the morning to the different bird sounds that we have when light first dawns. 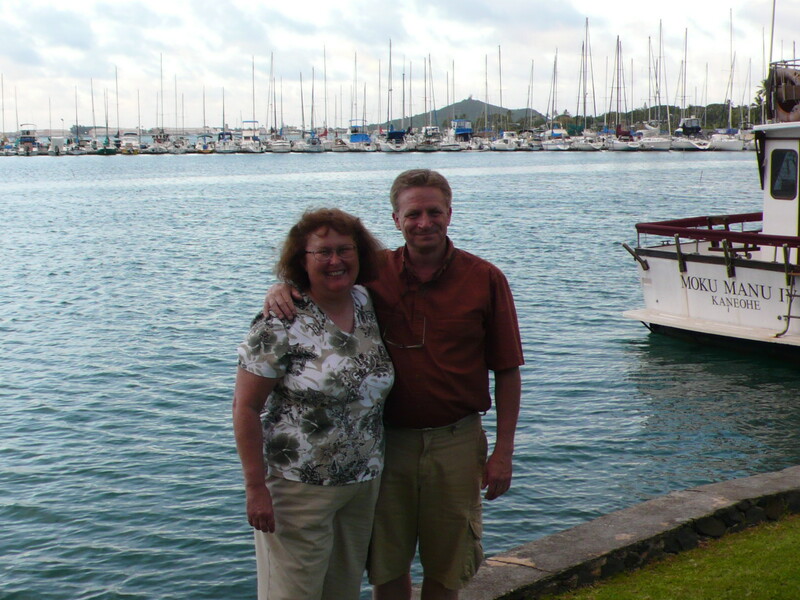 Mike and Jenni at the scenic point overlooking Kaneohe Bay on H3. The lookout on the opposite side of the road has a better view, but we were traveling in the wrong direction for that site. David and Mike at the demo. Mike is an amazing turner that you have to see in person to really begin to appreciate his talent. What really impresses is the comfort level he has going from project to project during his demos. We did our own version of how many people you can fit into a telephone booth. 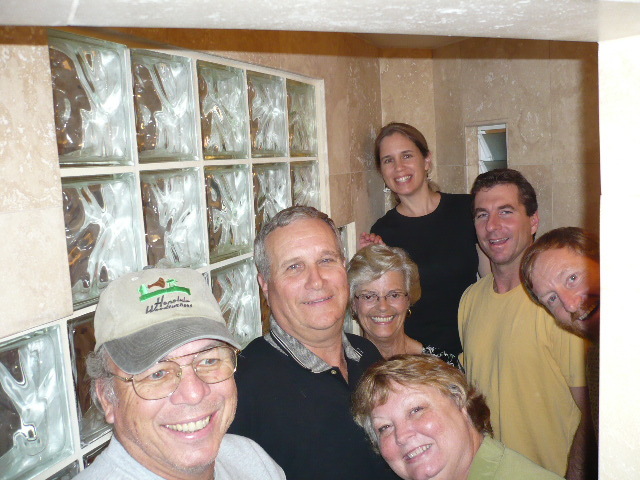 In this case, it was our shower, with Tom Young, Charlotte Freeman, Tim Freeman, Mary Young, Andy Cole, Jenni and Mike. Eli really puts a lot of effort into his demos, and does not relax until they are over. 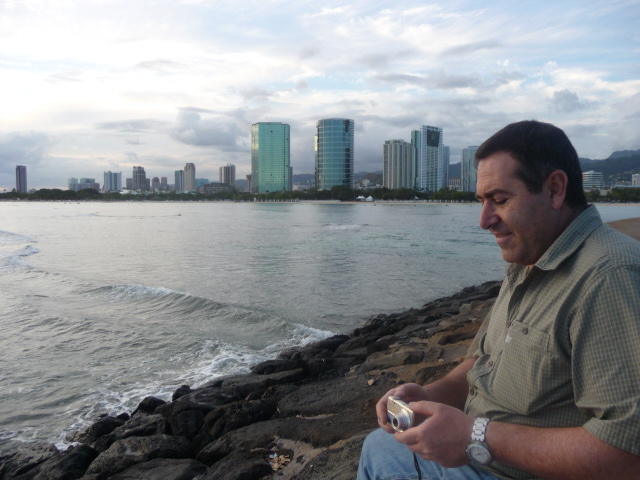 But afterward, he could relax a bit and enjoyed a stroll on Kailua beach. 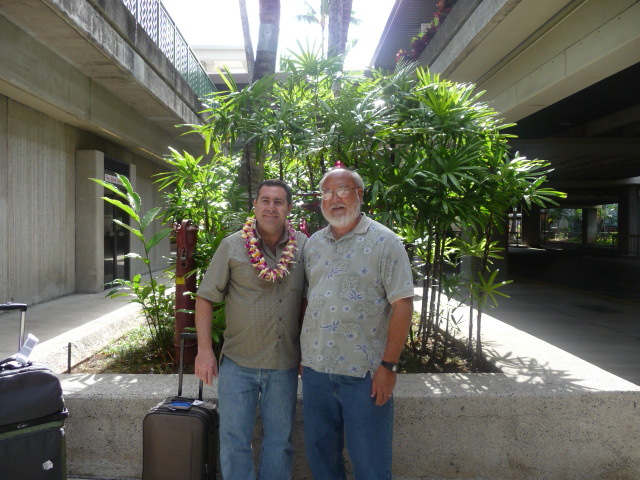 He really likes Hawaii, and talked about bringing his wife with him for another visit. He was a great guest and seemed to enjoy his stay here. Eli upon arrival at the airport. Eli relaxing in the garden. Eli on the shorebreak at Magic Island looking back towards Kakaako and Honolulu. 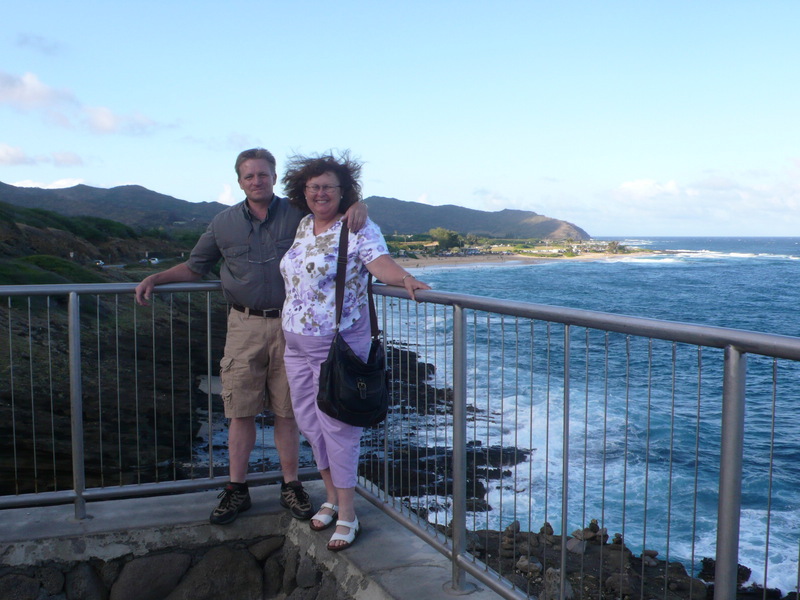 Kip and Kim at the Halona Blowhole with Sandy Beach in the background. At our neighbor’s yard looking towards Kaneohe Yacht Club. Kaneohe Bay in the background; using our son’s extended arm trick to get myself in the shot. 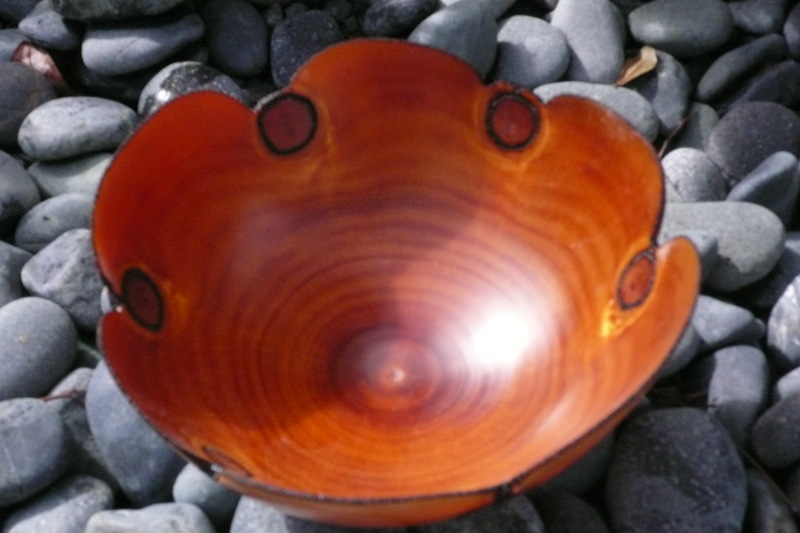 With the advent of the Kauai Woodturners group, Keith was the first demonstrator to do the Hawaii Hat Trick–three islands in two weeks. 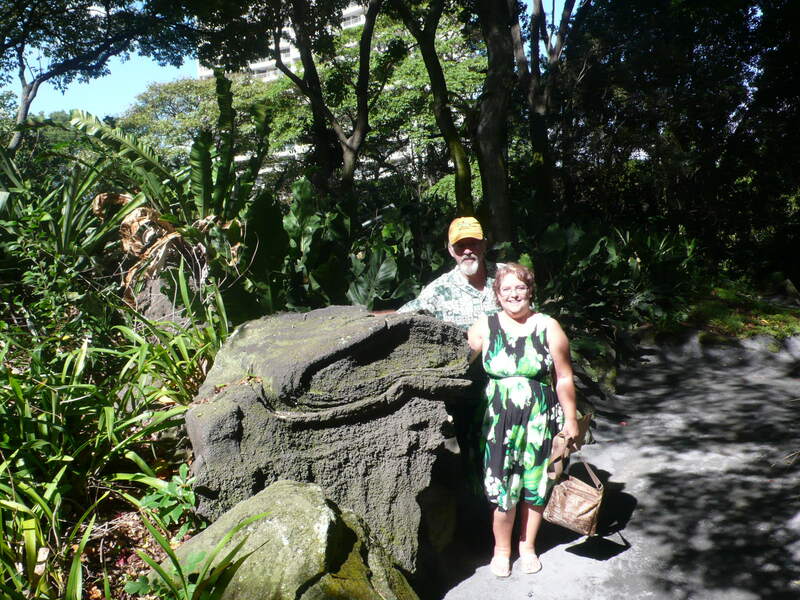 Keith and Lisa started out in Kona, then went to Kauai mid-week, and spent the following week-end on Oahu. This was their first time in the islands, and I guess they enjoyed it. “Best vacation ever”, I believe is what Lisa called it. They stayed nearby with Sandy Rhines and Julie as our house was a sick bay at the time. We managed to get in some sight seeing and had the use of one of our vehicles to get around. At the demos members enjoyed how Keith shared his experiences and where he gets inspiration from. He is a very creative person and the people who were fortunate enough to attend the hands-on really enjoyed the occasion. 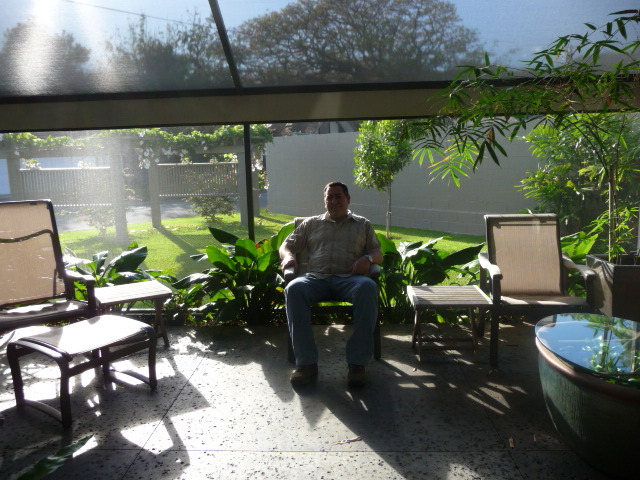 Foster Gardens is an oasis on the outskirts of urban Honolulu. With large, mature specimens of trees with soaring canopies overhead, you can almost forget the sound of the adjacent H-1 freeway. 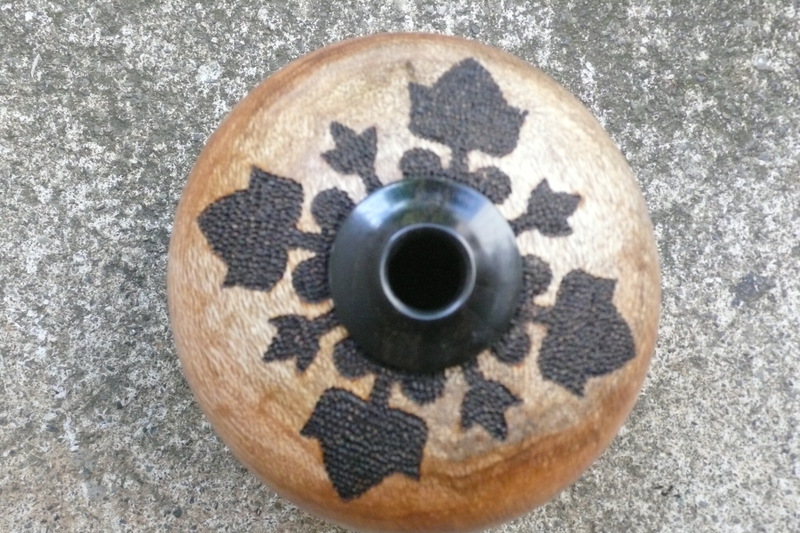 This spot is always a hit with woodturners, with lots of palm varieties, tropical ginger and heloconia, and exotics like the Cannonball tree. 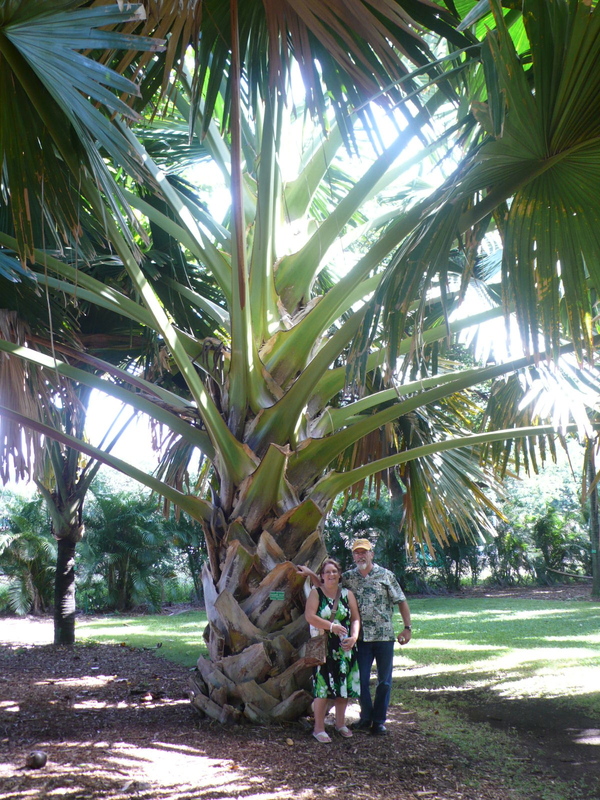 One of the many varieties of palms at the gardens. 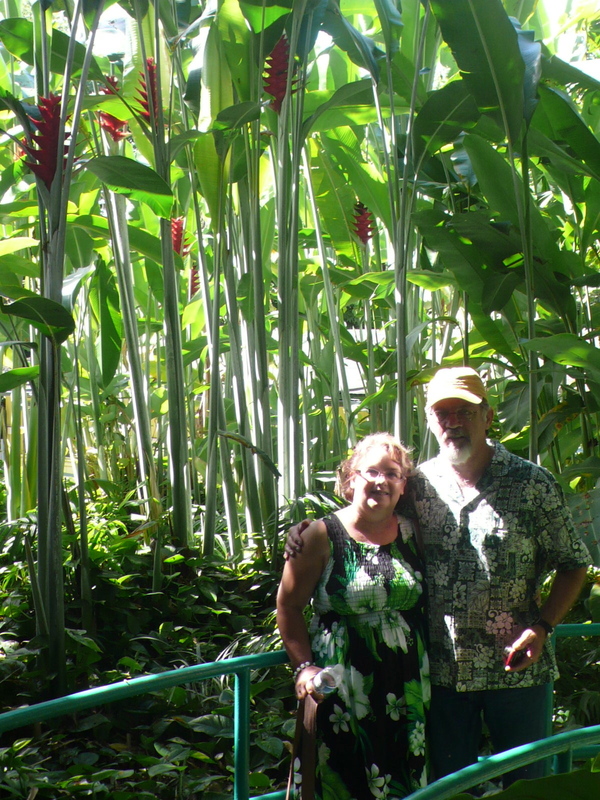 Tall heliconia at the entrance/exit to the gardens. On the day we went sight seeing we stopped for lunch at Nico’s at Pier 38. This place is always crowded because the counter service is quick and organized and the seafood is great. If you get an outside picnic table you can sit and enjoy the views of the fishing vessels nearby. Too bad I ‘foound’ this restaurant after Kip left, for he would have enjoyed the fish and chips! 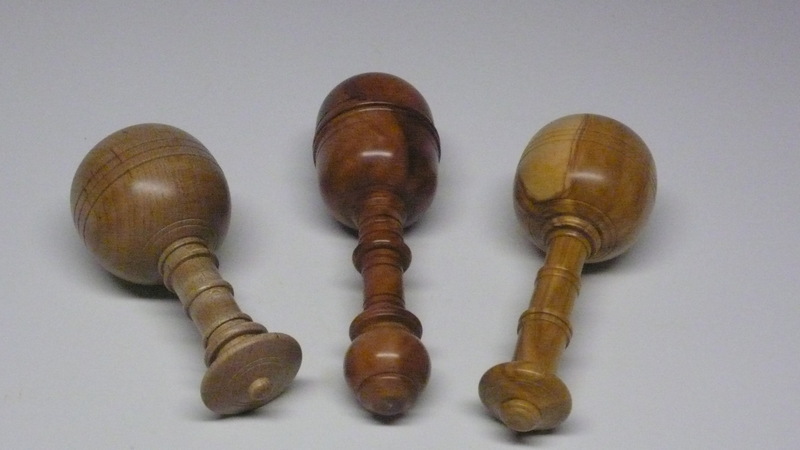 This post is meant to assist novices or people who have not made a lot of pepper mills using this mechanism. I use this mechanism that has an aluminum 5-sided shaft because with this mechanism a knurled knob is not required on the top of the piece. These comments assume that the general directions furnished with the pepper mills are used for drill sizes and depth of drilled hole. 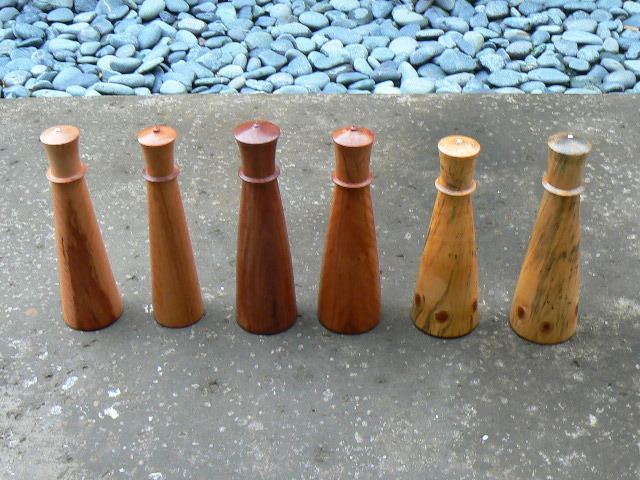 See other pepper mill post for photos of examples. The Crush Grind mechanism, made in Denmark, has a ceramic grinding element that should work well grinding salt as well as pepper and spices. I have had one returnerd, however, and what I saw was that rock salt was being used. The large pieces of had salt must have lodged into the grinding mechanism, caused the shaft to bind or freeze up and any hard turning of the top section may have stripped the plastic pentagon-shaped receptacle. The mechanism has two parts. The part for the top section of the mill has three prongs that have to be compressed slightly to fit into the 7/8″ hole that needs to be drilled at least 1-1/4″ deep. If the shaft is trimmed to project more than 1-1/4″ above the bottom section, this hole in the top section needs to be correspondingly deeper. If the top will not meet up with the bottom section when pressed down on the shaft, it may be that the hole is too shallow. 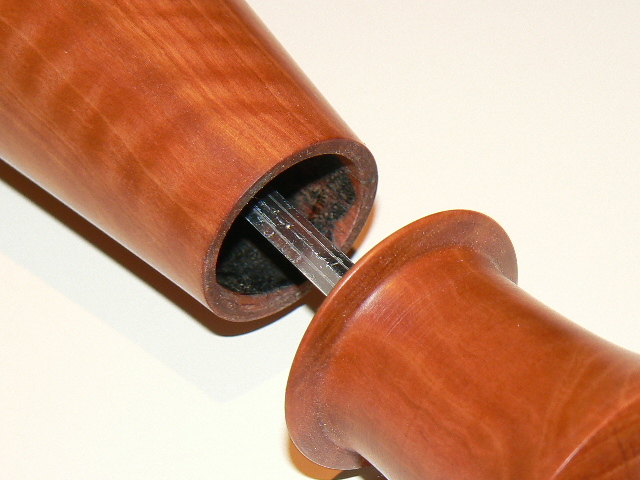 The top is a friction fit over the shaft from the bottom section, and removing the top is a pulling action that will tend to pull the upper mechanism out of the hole it is placed in. This is where a slot cut in the wall of the hole will help. If the slot is positioned just right, the three compressed prongs will expand into the slot, making it extremely difficult for the top section to be pulled from this insertion hole. A tool is now being sold to make this slot in the top section. Alternately, you can make your own–see the photo provided. If there is too much friction or if the shaft is frozen, the shaft may strip the hole as described above or the entire top mechanism may spin. On softer woods, the vertical fins on the top mechanism do not have to be cut or shaved off. This will help to stabilize the top section in the hole. For added insurance, I use epoxy glue placed in the hole before the top mechanism is inserted. Using any kind of glue with a plastic-to-wood connection can be problematic, but it makes me feel that I am doing all that I can to make the mills work well. The top mechanism sits proud of the bottom of the top section, functioning like a tenon when it fits into the hole drilled for the bottom section. This fit must be snug while the top can spin freely. Too loose a fit and the top section will wobble in the too large hole. To compensate for the possibility that the exact size hole will be too large because of drill bit wander, I use a 1″ diameter bit and after the hole is drilled, use a small gouge to enlarge just the top 1/4″ of the top of the drilled hole in the bottom section and “dry fit” a top section in the enlarged hole to test for snugness. The bottom mechanism fit must overcome a small ledge formed when the bottom hole is stepped down to a smaller hole. This is a tight fit and it helps to grind down the two compressible tabs on the bottom section a bit, so when the bottom section is pressed into the hole, the mechanism is not prevented from insertion by this ledge. I use a Beal Buff extension tube between the headstock and tailstock to aid in pressing the bottom mechanism into the holes drilled in the bottom section. On the headstock, I use a chuck that when closed, will permit the hole of the bottom section to fit over the closed jaws, and the shaft will still be able to extended in the hollow of the closed jaws. This is easier shown and done than explained. A slot can also me made for the two compressed tabs in the bottom section, but the bottom mechanism and shaft is in no position to be pulled out when overcoming the friction fit of the top section when it is removed.